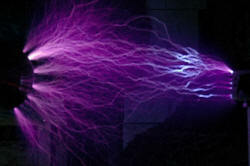 There are many ways of making high voltage covered in the High Voltage Supplies topic. 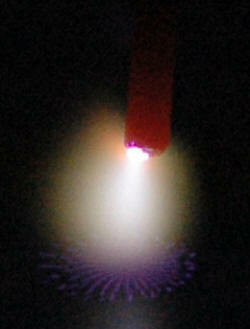 The associated sparks from each supply are covered there. Here are some other projects dealing with interesting things about the sparks themselves. Here are some of the effects that are produced by long exposures in a similar manner to the Eye of Sauron effect but not using a Tesla coil. 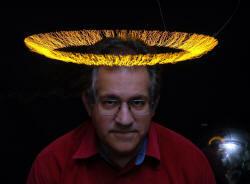 The photo above shows the "Sombrero" . Well it was meant to be a crown really. Note the reflection in the stainless steel ball which shows the sombrero as well as the flash and my wife and son operating the equipment. 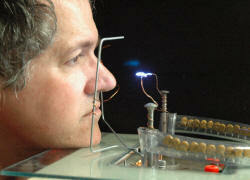 The left photo above shows the HV supply wired to a rotating setup that holds the electrodes. 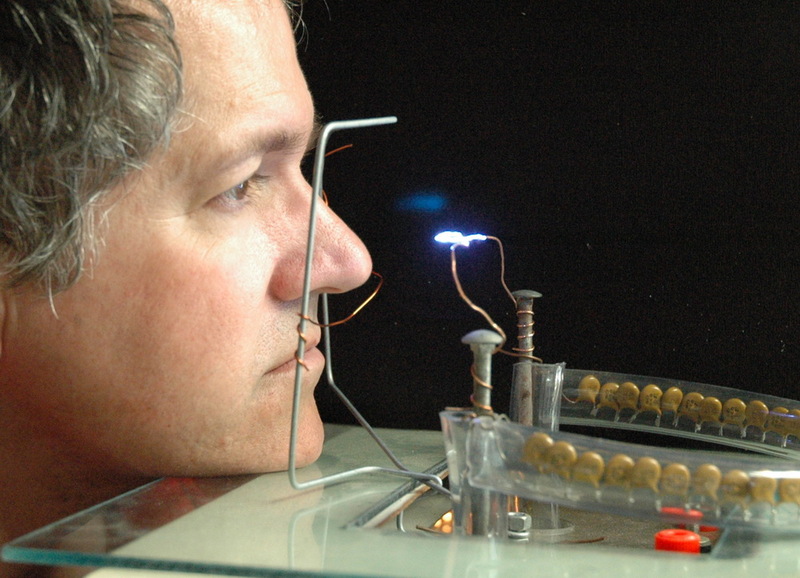 The right photo shows the electrodes which will rotate around the ball (or my head) and on a long exposure with appropriate orange filter which is removed before a flash to give "normal" lighting for my head. 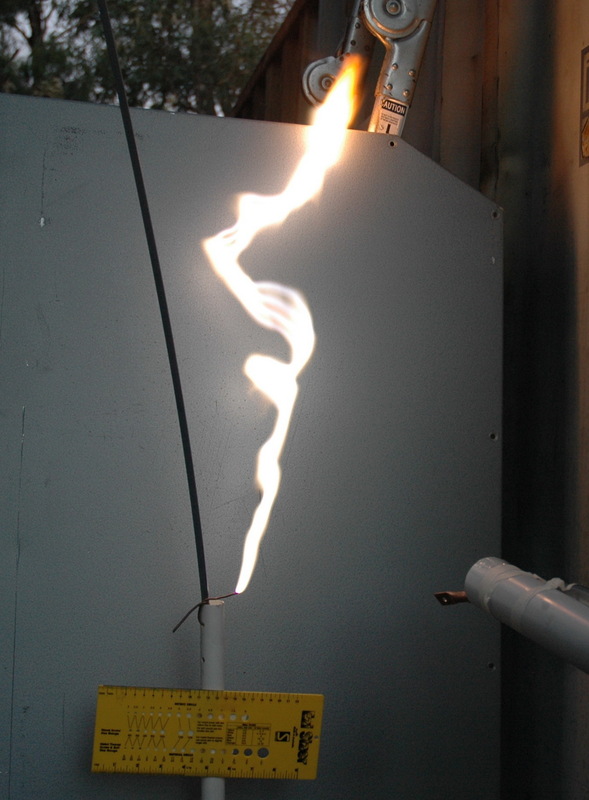 The photo above shows the effect off a higher current changing the bright sparks into a flaming arc. I should add that the whole sensation is a bit strange. The ionic wind and charge accumulation on my hair means I can feel exactly where the electrode is. The photo above shows an 'electric kris'. The kris is an Indonesian curved dagger. 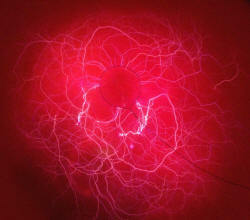 Here are some of the highlights of high voltage spark photos. 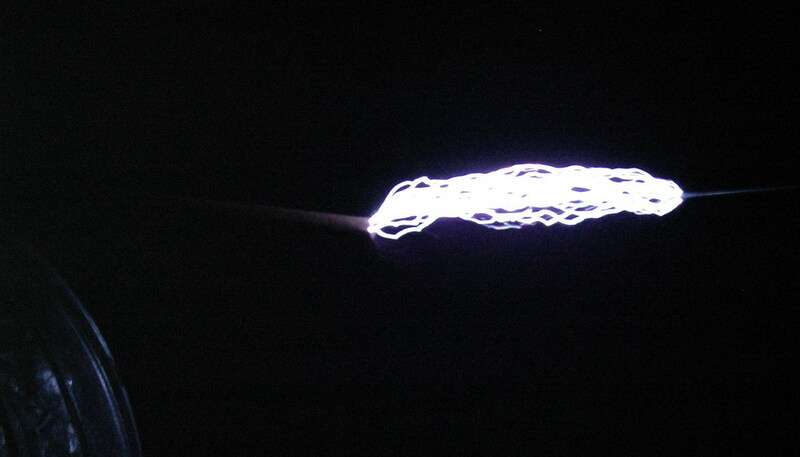 For a gallery of Tesla sparks go to Tesla sparks. Above left photo shows a 5 inch (12 cm) arc from a mobile x-ray supply. 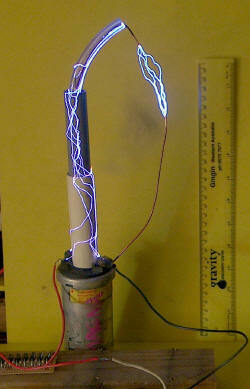 It is DC about 100 kV with a large capacitor but goes through a large HV resistor within the white tube. There is a large convoluted power arc that last about 1/2 second. 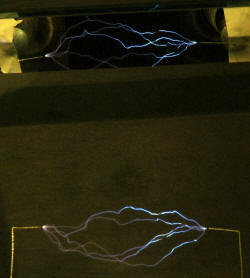 The right photo shows a 26 inch arc from another larger x-ray transformer running about 40 kV. It only jumps just over an inch but like a Jacobs ladder just grew and kept rising. Alternatively one can use SIDAC's. 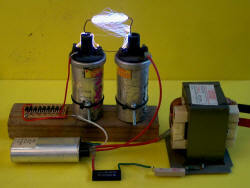 This very simple circuit uses the transformer, capacitor and diode out of a microwave oven to supply 2000 VDC. 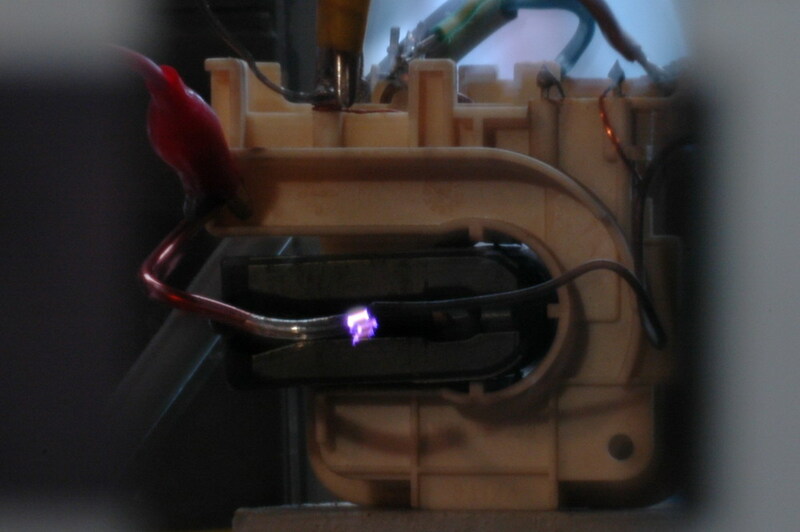 Once the voltage rises to 2000 V the SIDAC's fire dumping the energy into two ignition coils to give sparks of easily 5 cm. 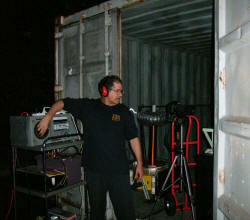 I am using 9 SIDAC's each rated at 240 V 1 A RMS and 20 A pulse. Each is shunted with a 1 Mohm resistor to give more even voltage division. There is a 10 Kohm 10 W resistor used for these shots but power draw is triggering a 10A cutout and there is sufficient heating of resistor, diode and SIDAC's to only allow short runs. 50 Kohm will allow about 4 sparks per second. Unfortunately this is very hard on the ignition coil's insulation. I have lost one coil but the remaining one still puts out 3 inches and also about 10 inches of surface tracking (below). The left photo with the safety glasses was to get the reflection. My normal glasses have an efficient anti reflection filter. The center photo was a lot harder than I thought. To get a close up of a face and sparks in one shot with a reflection in an eye means a long exposure and F stop backed off all the way to 32. Almost a pinhole camera. 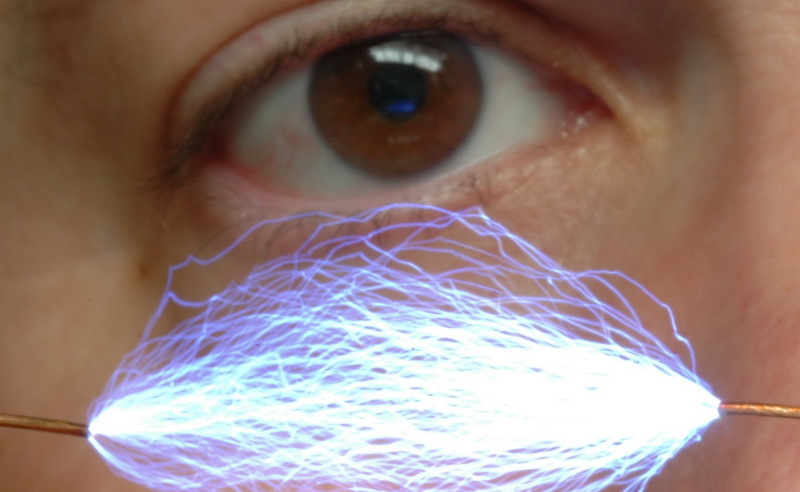 The virtual distance of the reflected spark is so far away that it will be really out of focus and also so much smaller and fainter due to the convexity of the eyeball. 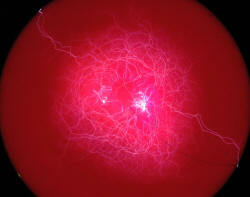 So it meant a lot of sparks to get a blue blur on the corneal reflection. Without the reflection it looks photoshopped. I have to hold my eye open and be absolutely still for 10 seconds while loud IC sparks fire off in front of my line of vision. The right photo shows the setup. Having the spark closer is helpful but you can't get a 2 inch spark closer than 2 inches to your nose. I was also a little worried about cumulative UV exposure to my eye with the many takes. This is a standard screwdriver. It is interesting how the arc bends around it. This is because the hot arc channel is a low resistance but the air just next to the screwdriver is cold (or at least not not ionised and would have to be "jumped" by a sufficient voltage for it to connect. This only happens with stable pulsed DC or AC arcs. One could make up a bit of a pseudo-explanation for this and indeed I have on the 4HV community. While I was waiting for my deionised water to freeze around my coinshrinking setup (in 2005), I thought I would do some HV conductivity tests. 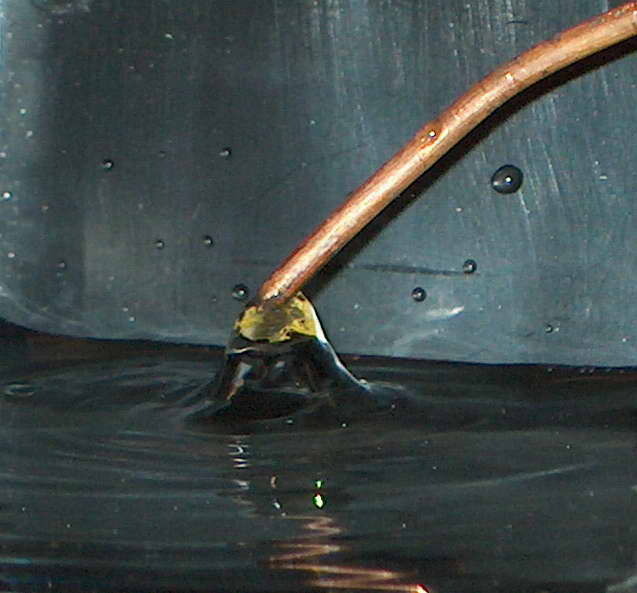 Photo above left, shows the effect of an electrode with 4 kV DC across it when dipped in the water. There is no sparking since pure deionised water is an insulator. 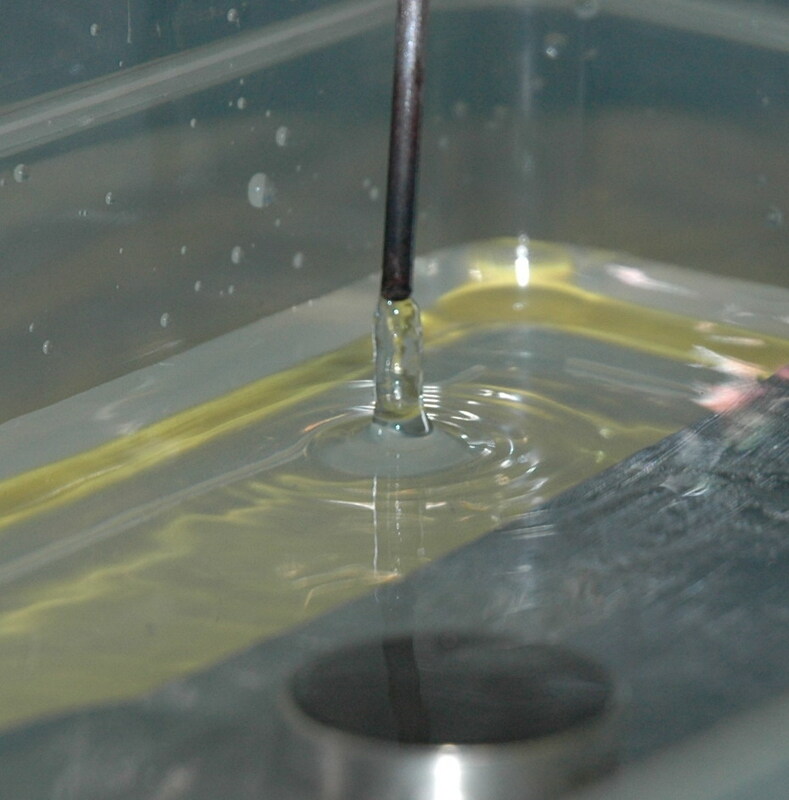 The mutual attraction of opposite charges creates a spike rising up from the water to meet the electrode. Almost ferrofluid like. The yellow tip is a reflection of the yellow base which is my theme background color in most of my photos. This spike is stable although there is a moderate water flow around it. Wire width is 0.09 inch (2.2 mm). 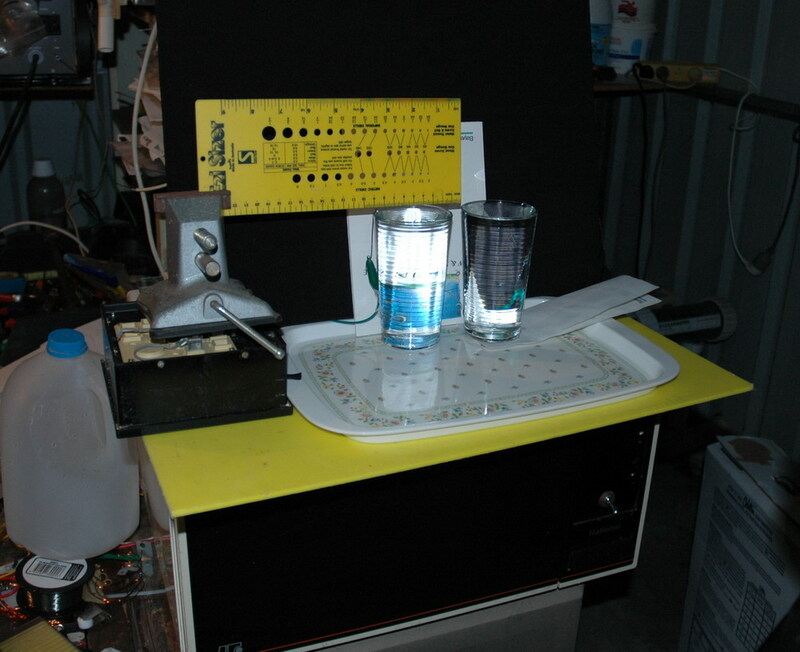 This "water bridge" experiment (from 2007) was published in Physics.org in Oct 2007 and I replicated it below soon after. 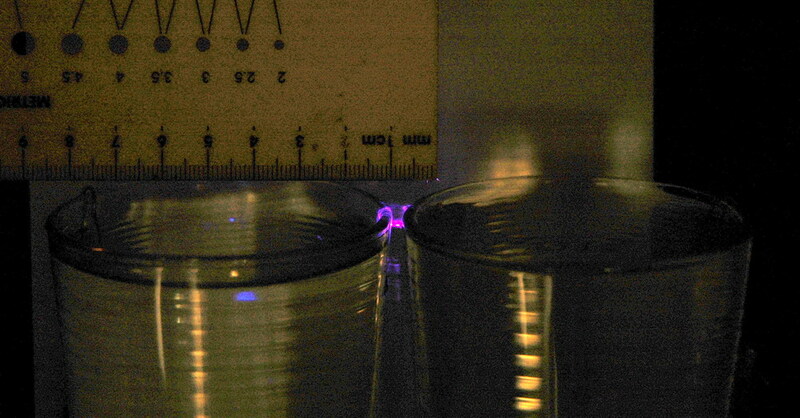 The left photo above shows a water "bridge" sustained with about 9 kV DC with two drinking glasses filled with deionised water. It extends about 12 mm. The right photo shows the varying width due to some instability. 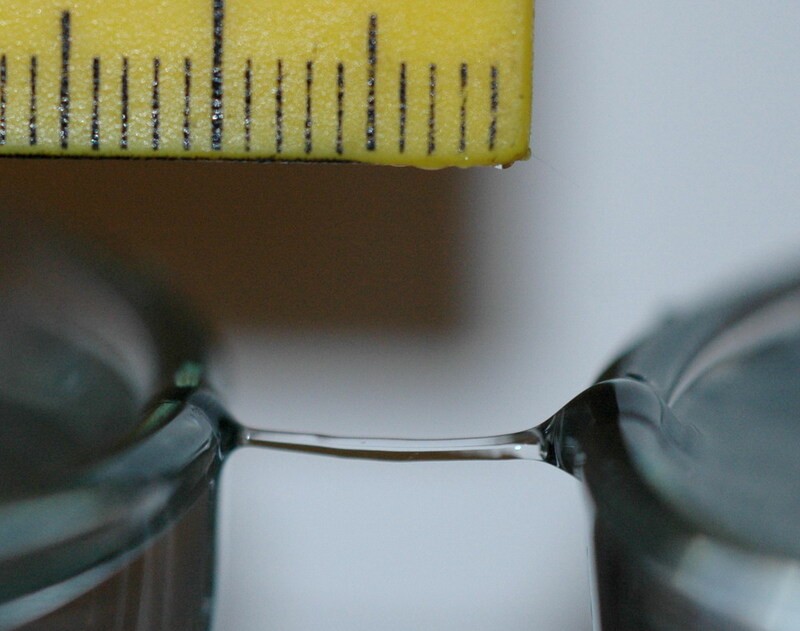 Bill Beatty's site has info on the Wasserfedden (water-thread) effect. Apparently 100 years ago they used a Whimhurst static machine to provide the voltage. 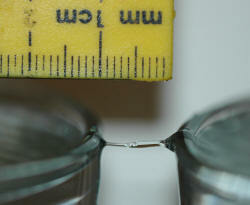 A small silk thread across the lips of the glasses provides the starter which then slides out when the flow starts. There is apparently two way flow through the bridge determined by putting dye in each side. The left photo above shows the full setup. 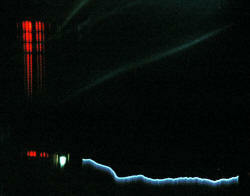 The right photo shows corona between the two glasses (no water bridge here) in a 30 second time exposure. The sparks are very faint and this experiment is about electrostatic attraction rather than current flow due to the insulating properties of deionised water. Now this is really colorful. 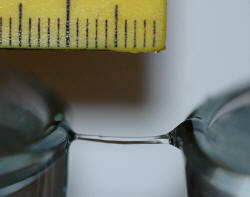 Pass a lot of DC current onto deionised water and you get remarkable patterns at the water surface. As the deionised water became conductive enough to sustain a higher current , the faint and feeble spark increased to a power arc to water of about 2 kV DC eventually to the point of making the wire red hot. The first 3 photos all show interesting variation in the surface effects. 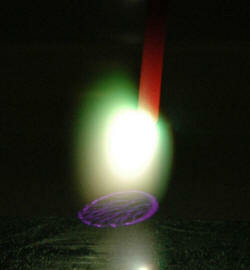 The green glow is the copper from a hotter arc. 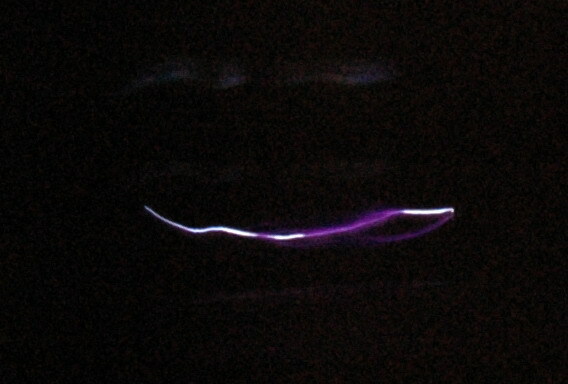 The last photo shows the spark playing over a magnet. 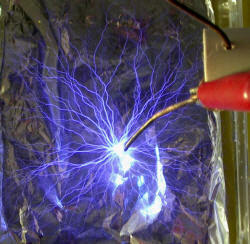 This shows DC sparks from my flyback supply with a 0.2 uF capacitor providing a spark energy of perhaps 10 joules at 10 kV. In air this spark will jump less than 1/2 inch (1.25 cm) but surface tracking means that this will be many times longer and gives a widely branching long spark suggesting a much higher voltage. 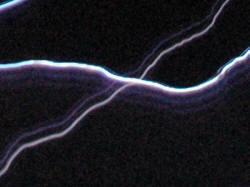 The left photo above shows a single discharge and the centre photo is a time lapse shot of multiple shots. The right photo shows a spark direct to the other electrode about 4 inches away which discharges the full 10 joules with a big bang. Picture scale is about 3 inches (7.5 cm) across. 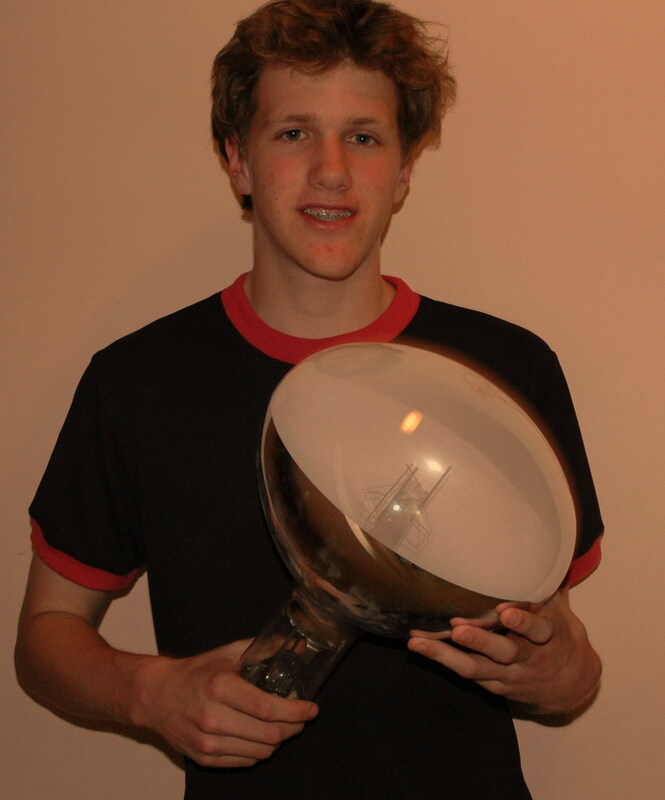 I used a very large light globe (10 inch diameter) and applied high voltage from my ignition coil setup between the filament and a small wire loop in the front. 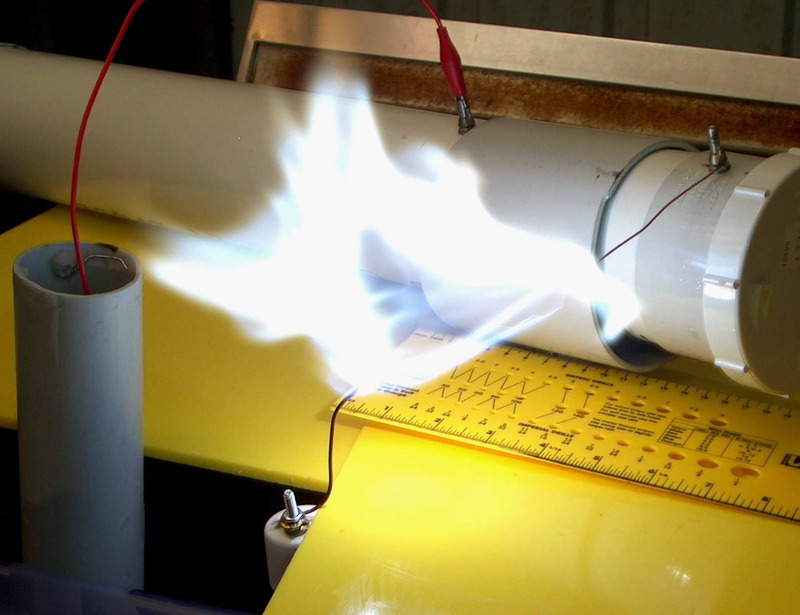 This results in the front of the tube lighting up with long sparks like a plasma globe. The effect is quite dramatic and colorful. The left photo shows the spray of sparks to the wire. This is natural color with no processing. The center photo shows sparks jumping over 6 inches around the outside of the globe. The right photo shows the globe. Apparently originally made by Benjamin Franklin as an audible lightning detector, these have a small swinging metal object between an earthed bell and a bell attached to the high voltage. 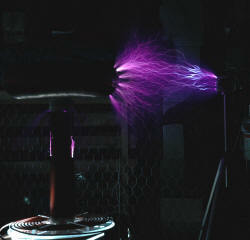 The metal object picks up charge from the high voltage side and being similarly charged is repelled to the other side. 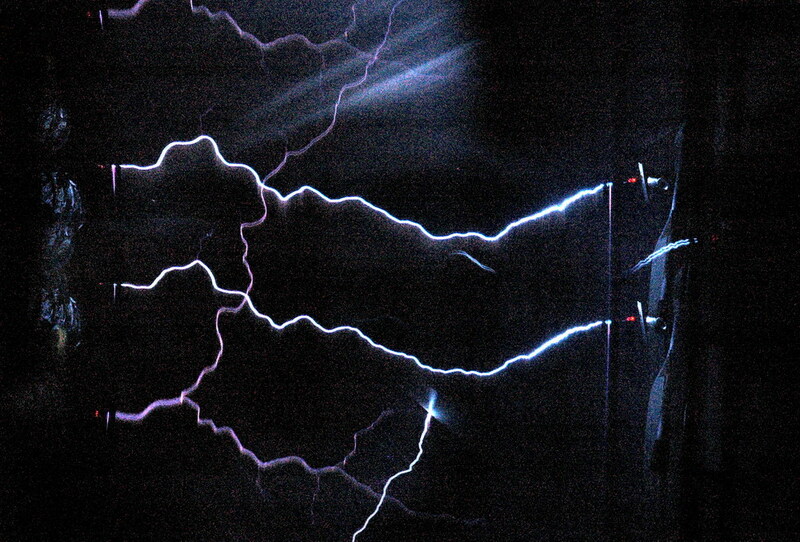 As it touches (thereby ringing the bell), it transfers its charge to earth and swings back to repeat the process. A simple setup is here. The top photo above has the power off. 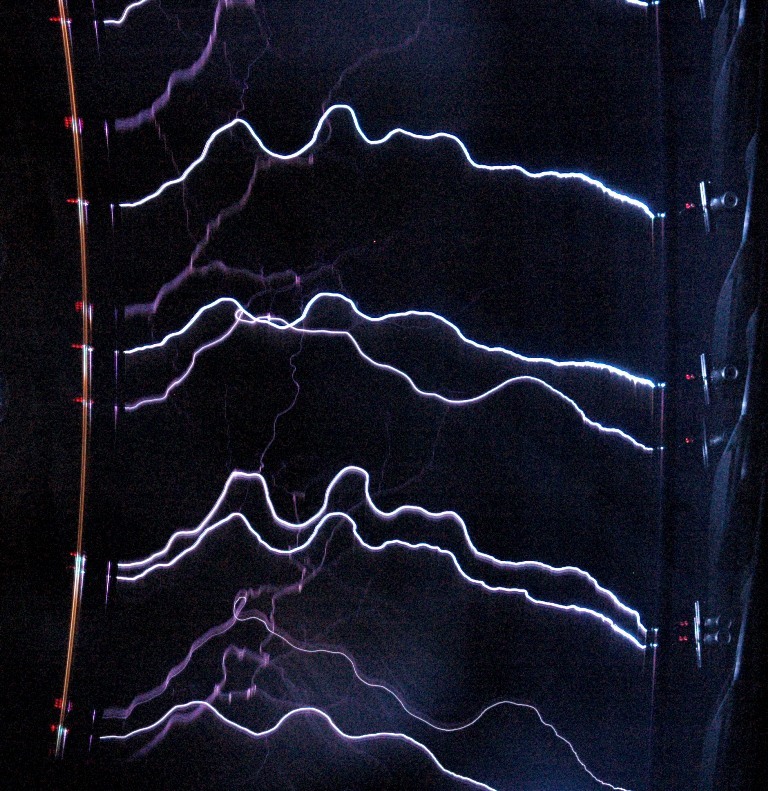 Once it is turned on to perhaps 50 kV the cans undergo a lot of agitated movement as shown in the longer exposure. The bottom photo shows the sparks in the dark. 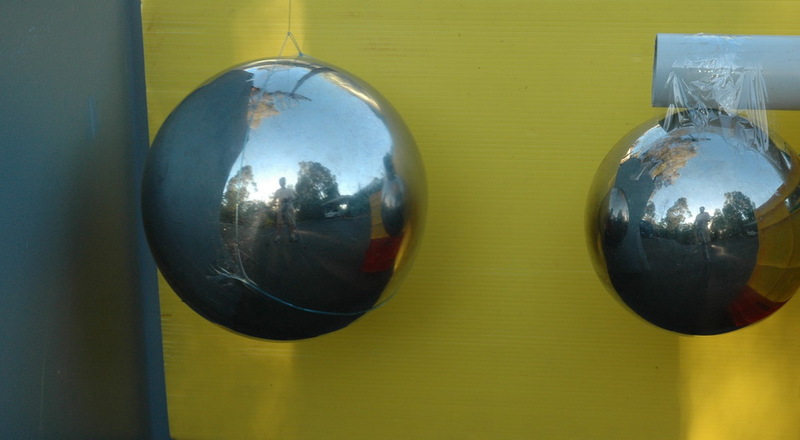 Now for some larger spheres to make a Franklin's Bells setup. 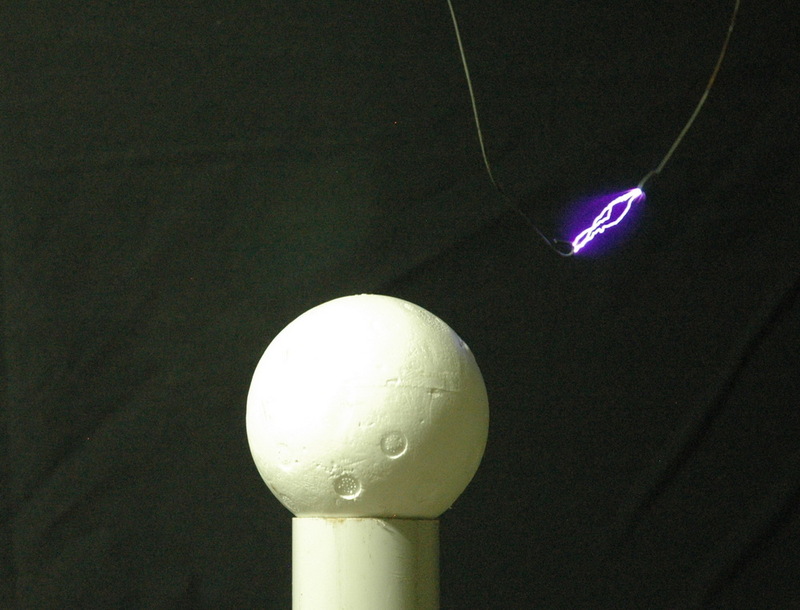 The large (12 inch) sphere is capable of being charged to a much higher voltage before breaking out and losing it. 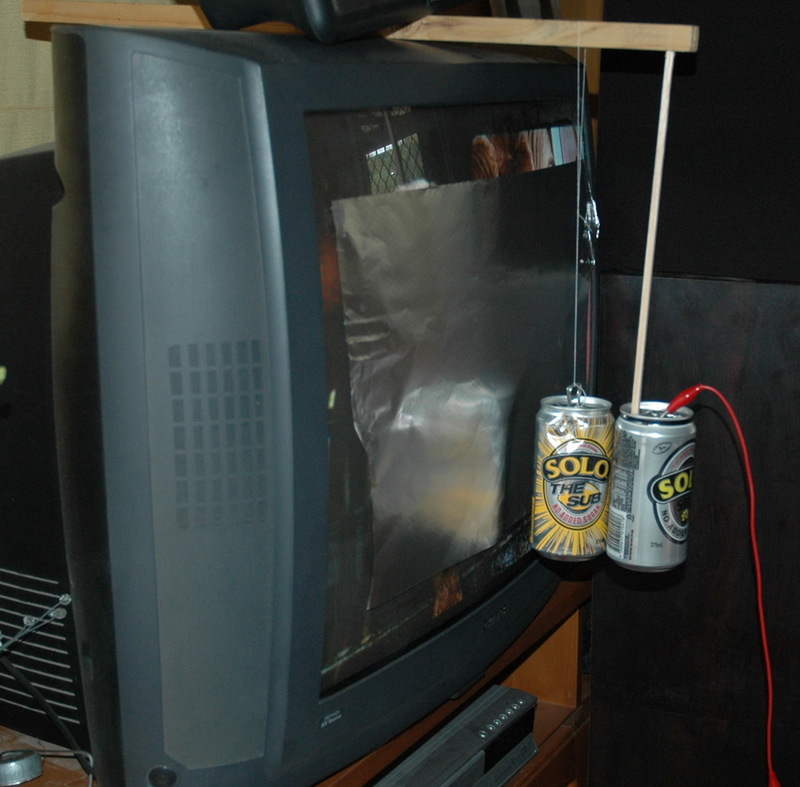 It is hung from a basketball hoop with fishing line. The left photo above has the power off. 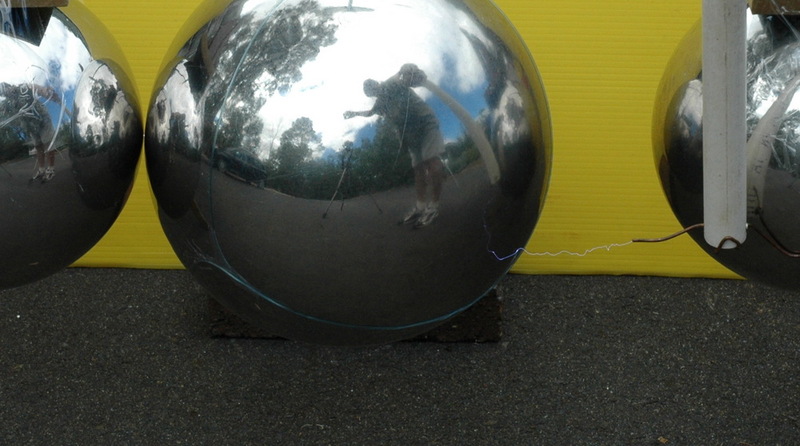 The right ball (10 inch) is connected to my HV supply which will give 4 inch sparks from sharp points so perhaps 80kV. The earth is at the left and is a large metal sheet. The right photo shows the balls in the dark with power off. 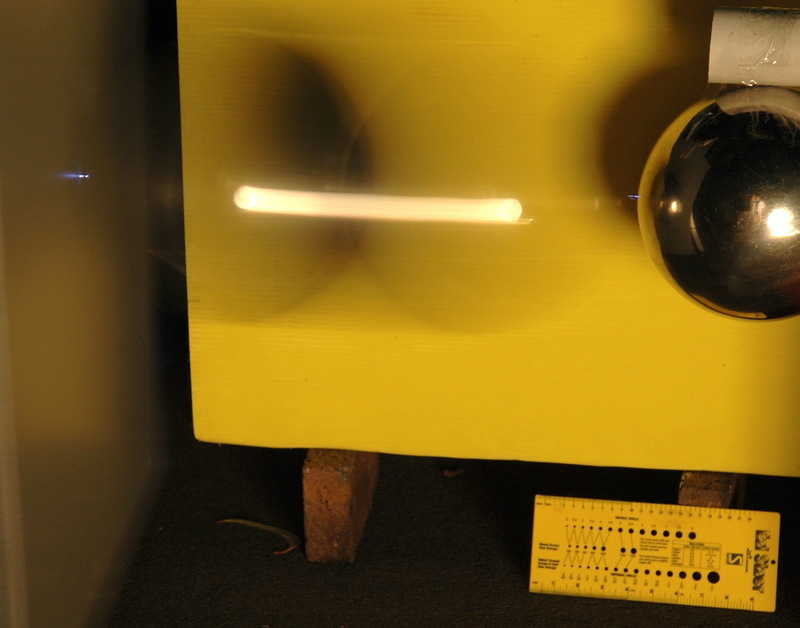 The left photo shows the 12 inch ball is a blur of motion as it swings through a 10 inch arc striking each side in turn with 1/2 inch (1.7cm) spark appearing as it comes close. 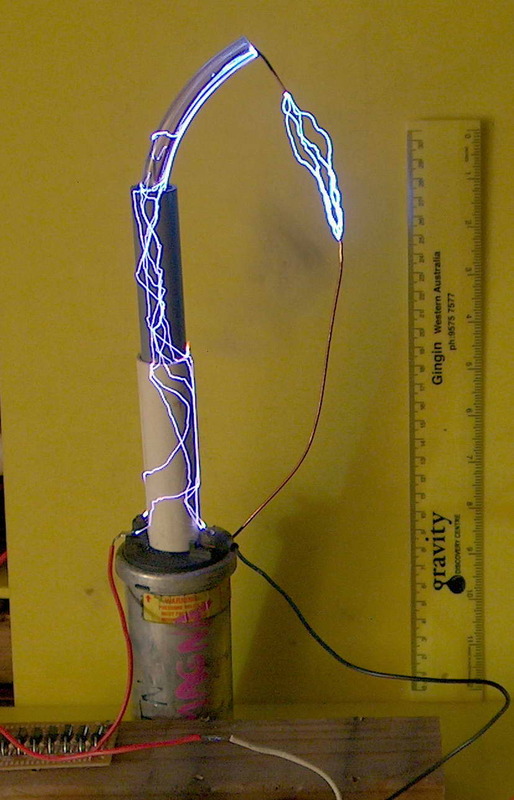 This equates to at least 50KV according to spark gap tables. 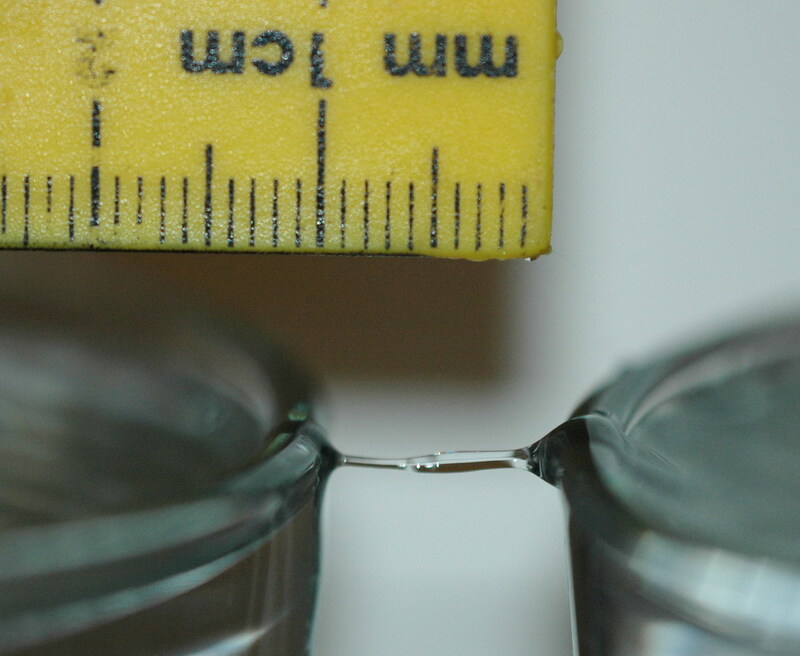 The right photo shows the spark at either end and a ruler for scale. This setup above shows the size of the sparks from the supply which are about 4 inches. This is from a breakout point on the negative side. To and from a sphere the sparks are much smaller. 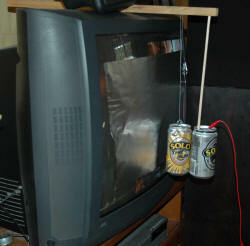 This left photo shows a simple Franklin's bells set up using high voltage from a TV screen. There is a sheet of aluminum foil stuck to the screen. One can is free to swing back and forth and the other is fixed. 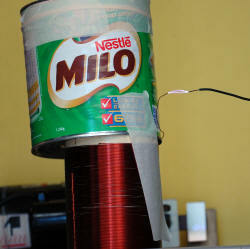 The fixed can is earthed to a metal object that is mains earthed. Like the outside of a toaster. 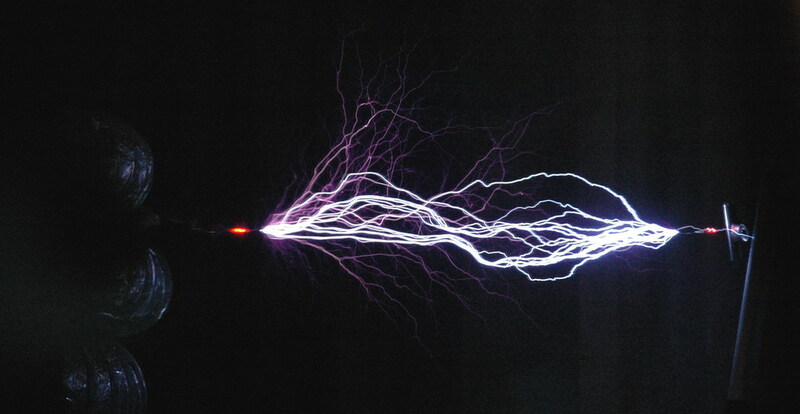 The best effect is when the screen is turned off and on when you can see sparks. 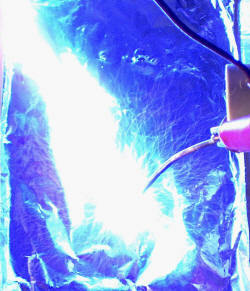 These are simple static type sparks and are safe for you but not necessarily other electronic equipment. 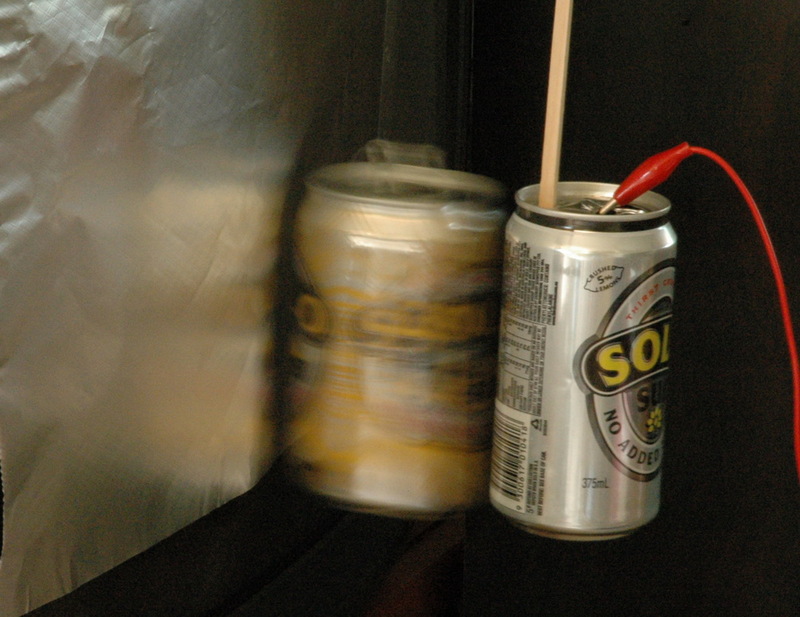 The right photo shows the can swinging in the longer exposure. 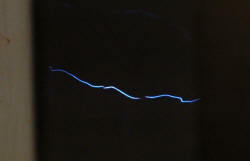 A spark should be a continuous line, jagged but without breaks. Right? So I thought too until you look closely at single sparks when you can see gaps. 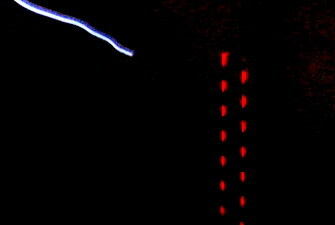 The photos above show sparks from my ignition coil setup with perhaps 10 sparks per second. This single brief impulse means that there is not a second spark going down the heated channel of the first. You can see gaps in the spark channel which is viewed here end on and magnified. Sometimes there is a hazy glow in the gap but often not. 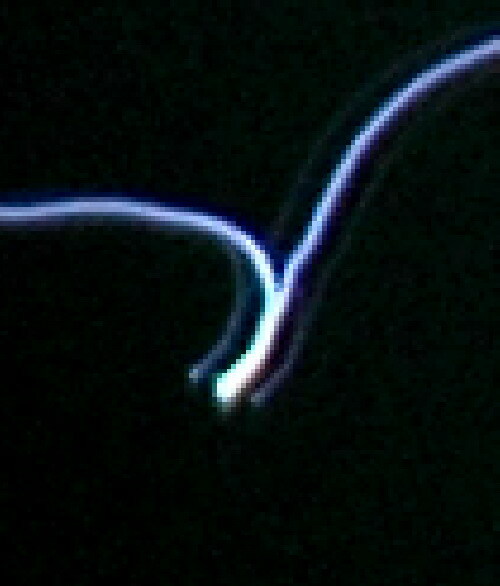 Here is another example with the magnified view. 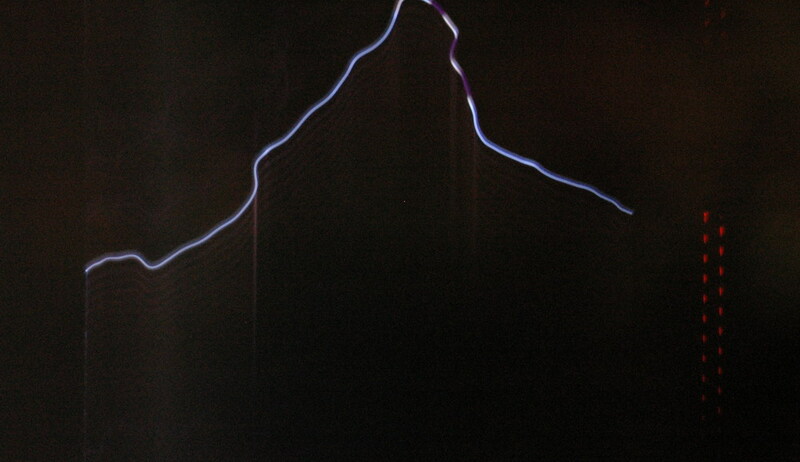 The left electrode is negative in this DC spark taken through my 300 kV diode so this is a negative side effect. 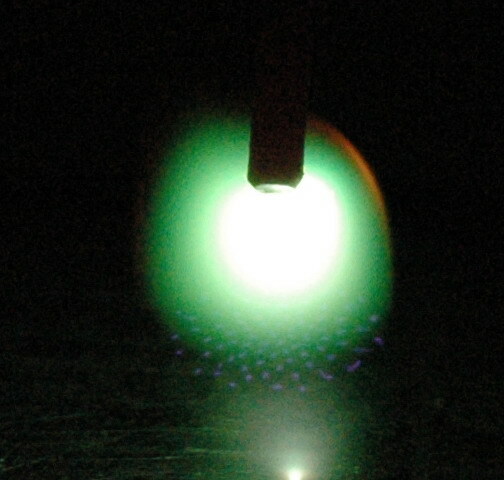 The photo above shows the Crooke's space in a neon tube at reduced pressure. So there is a precedence for gaps in the spark channel. Sparks don't have uniform brightness as well which may be a related effect. About one third of the negative end of the spark is brighter as well. Although this is a spark from a coil it is being driven by a DC pulse and can be regarded as polarized. I therefore suspect that this is a feature of the spark, presumably analogous to the Crooke's spaces seen in lower pressure discharges. 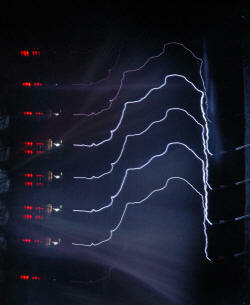 Since you often see this with Tesla coils maybe the discharge is polarized there too. Above shows the bright area in the spark seen in a Tesla coil discharge. 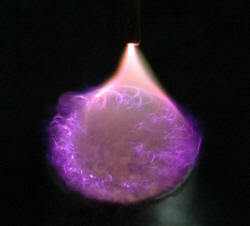 Generally seen when sparks are low power and purple rather than hot white. 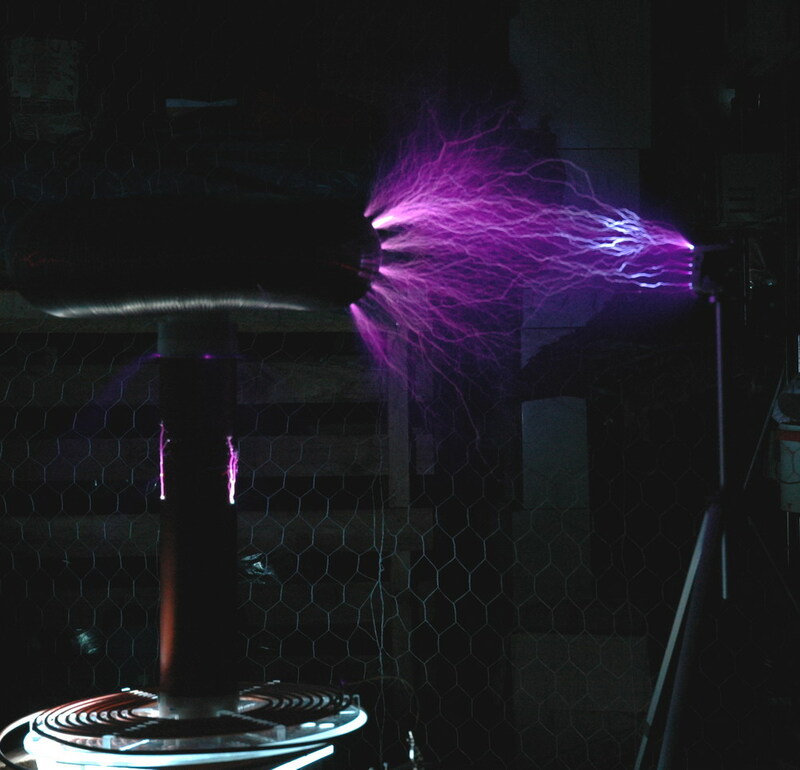 Sort of suggests that a Tesla coil sparks that only just connect are from a primarily positive discharge from the toroid. The spark above is viewed in two directions at the same time using a mirror at 90 degrees angle. 3 of the 5 sparks have gaps and they are present in both views. The negative end is brighter as well. Now this is interesting. This is taken through a rotating mirror. 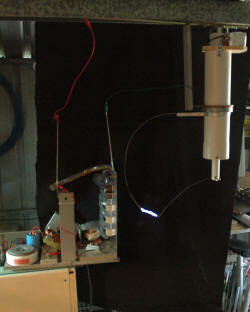 I joined a first surface laser mirror to one of my motors. Running at 2250 RPM and with the spark 16 cm away the radial velocity of the spark is 37 m/s. With the image being only the negative 2 cm of a total 7 cm spark width, the vertical distance of the photo is 500 us. So you should see events in the region of 10 us easily enough. There doesn't seem to be any structure at that level around the discontinuity. 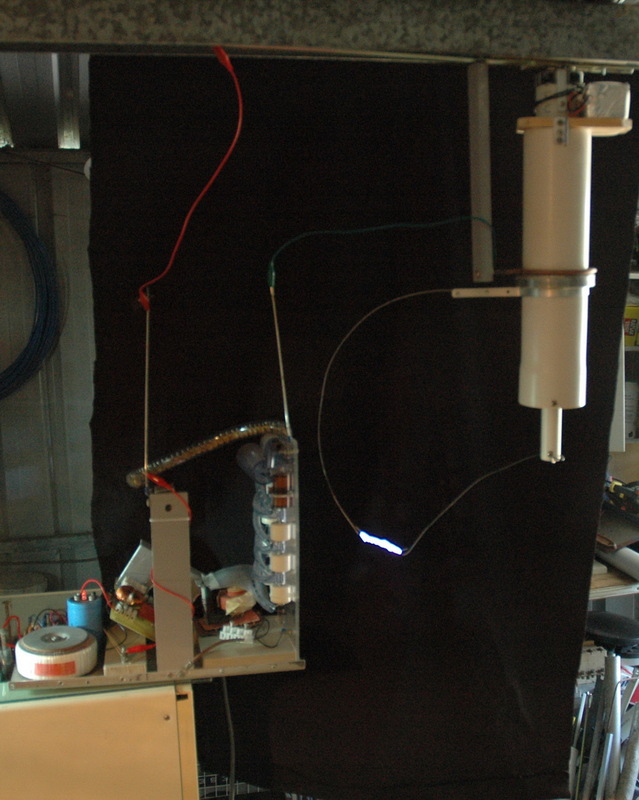 The Tesla coil above is my junk coil running on half of a 12 kV 30 mA NST. It has a few ceramic caps and a 3 segment static gap. Primary is 15 turns and secondary is 260 turns in 11 inches. 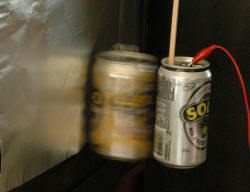 There is usually no toroid but I used one to intensify the sparks by putting an old tin on top. The gap is only about 2 cm to all fit in the mirror view. You can just see the spark in the mirror in this photo. Of course, with each spark lasting microseconds or less it becomes harder to catch a spark in the mirror. 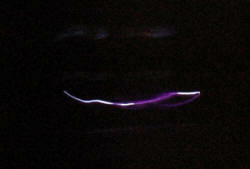 Even with 2 second exposures and the spark firing at perhaps 20 Hz you only get a spark in view occasionally. It should be easy to increase the resolution by a factor of 10 - 20 to see events at microsecond level. It may take many minutes of exposure to get a spark though. This would be of great interest to Tesla coiling to get sparks seen on that time frame. Note that this is not a true high speed photograph. 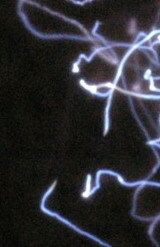 Vertical movement of the spark on the image may be due to irregularity of the spark or due to events happening in time. Multiple spark channels should show up well or stepped leaders perhaps. 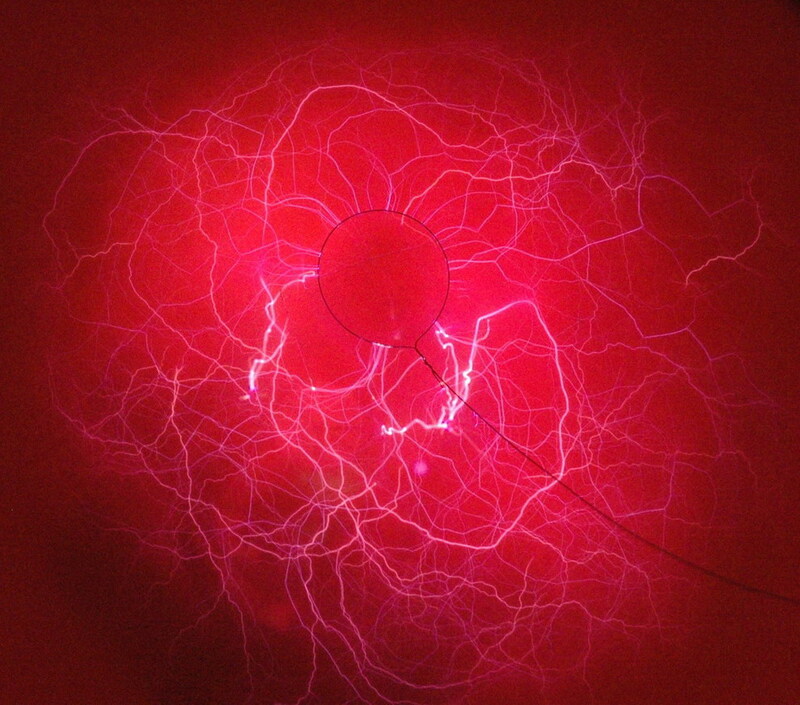 The left photo shows a single spark and the centre photo shows multiple sparks captured with a longer exposure. Mirror to spark distance is 38 cm which means that the image moves at about 100 m/s. The picture represents about 2 cm width and 4 cm height i.e. vertical scale is 40 us. (just over 100 ns/pixel). 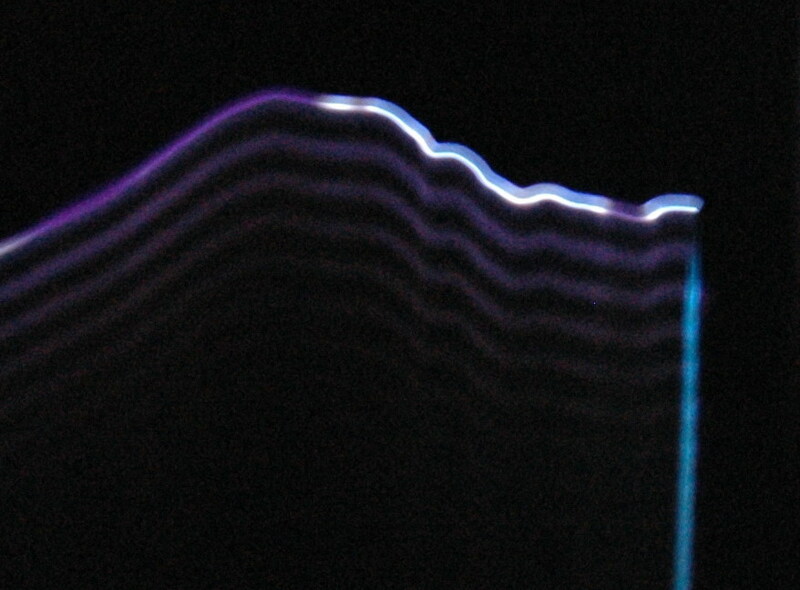 The right photo shows a view of a LED being flashed at 100 kHz hence the distance between each LED is10 us. So what do we see and how to interpret it? 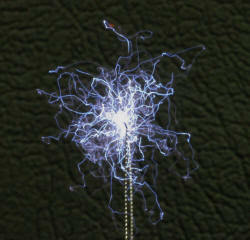 There is a ladder of sparks with each spark being fairly discrete and without any obvious parallel sparks. All sparks seem complete and there are no discontinuities. Almost all sparks are bright at the ends but less bright in the centre third. This also corresponds with what you see when it is running. I am not sure what it means, however, if each spark is a single cycle then the negative one third may brighter each half cycle, leaving the centre dim. The left photo shows a Royer ZVS circuit firing a rewound inverter MOT transformer to give perhaps 2 kV at 15 kHz. It wasn't bright enough to show so I later added a diode, resistor and .06uF mica cap to give a brighter spark which was rather irregular due to the low firing voltage. The right photo is 100 vertical pixels = 10us showing 3 sparks of less then 1us duration, which appear to deviate from a vertical line. Going back to the setup photo, you can see that one of the electrodes is vibrating changing the spark position. 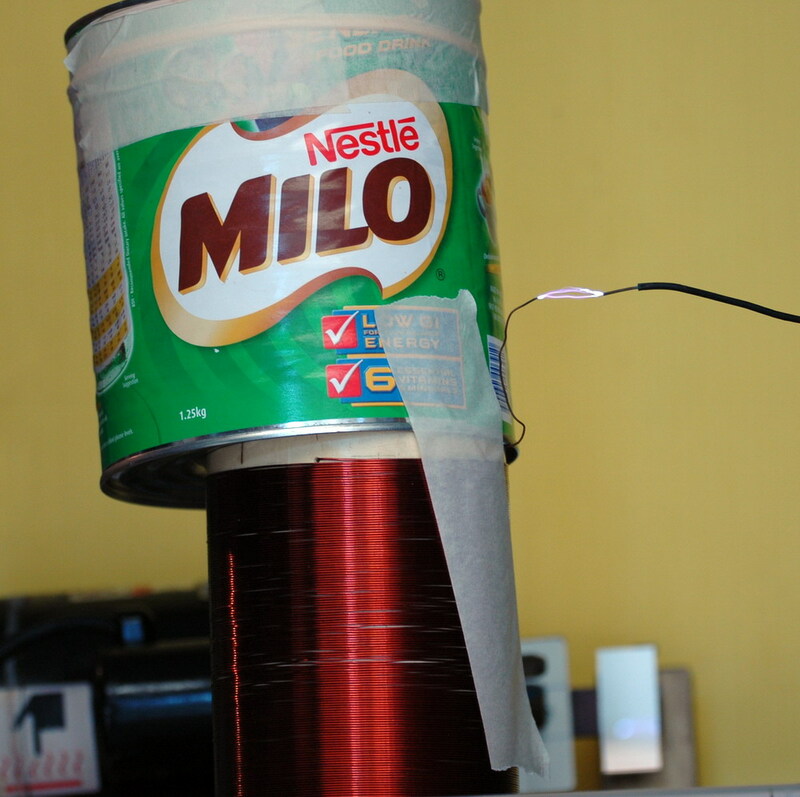 The 3 sparks suggest that there is a resonance at about 10 us period - 100 kHz due to the .06 uF cap and the effective series inductance of the cap itself plus the two 8 inch crocodile clip leads. As you can judge by the pixilation (automatically smoothed by the software) plus the noise, the camera is being pushed to the limit. Very small sparks still seem to be point events. Hopefully a 2 foot TC spark will have more structure. To see speed of light events I would need to have 500 foot events which would be 1us. 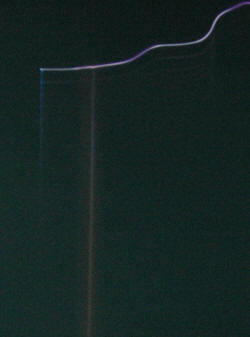 In fact it would not be too hard to bounce a laser over a path this length to show the speed of light. Hmmm... I have a corner cube prism and two eight inch parallel first surface mirrors. Add a beam splitter or two, line it all up and go. Ohh, and it needs to have picosecond switching. Did I mention that? 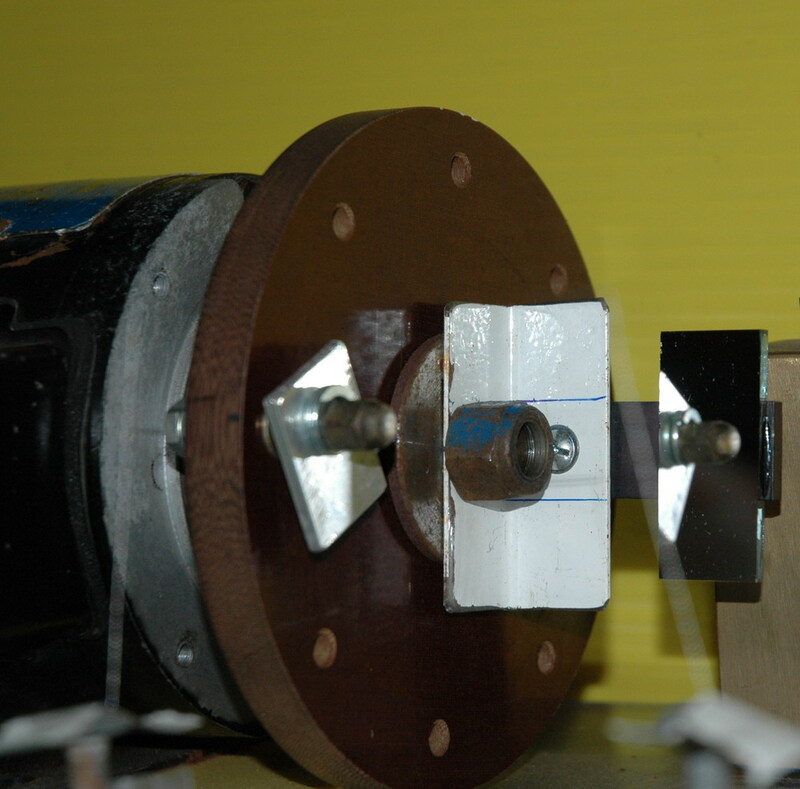 Maybe my scanner Hex mirror assembly could rotate the laser beam to give fast enough effective switching. Head is starting to hurt here. 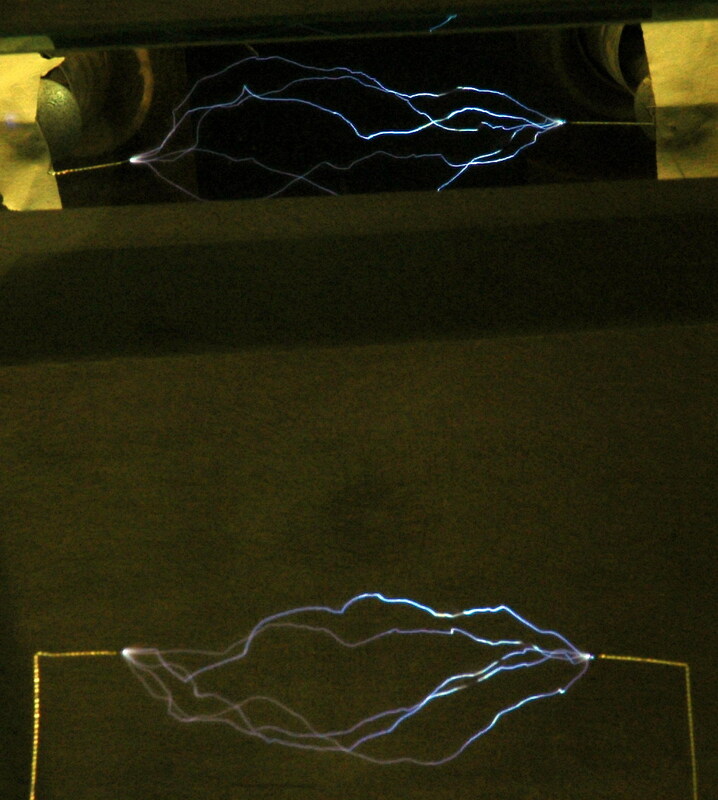 Here are some Tesla shots with the rotating mirror setup as above. The TC is my 4 inch one. 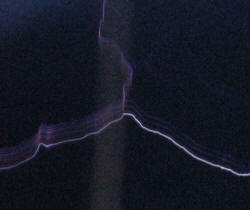 It was set up for 4 then 6 inch sparks between pointed electrodes to a grounded object. Power was 4 MOT's and current draw about 10A 250 V so enough to have a reasonable power arc rise in the centre if it got going. The distance from camera lens to mirror was 30 cm and from mirror to TC 140 cm. 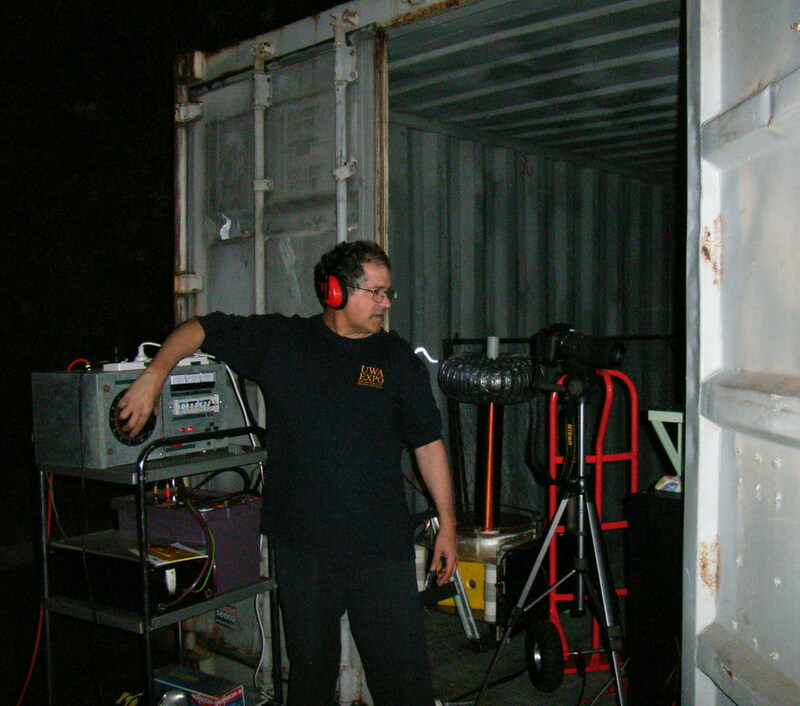 The left photo shows the the setup (taken with my older camera) and shows the TC at left. 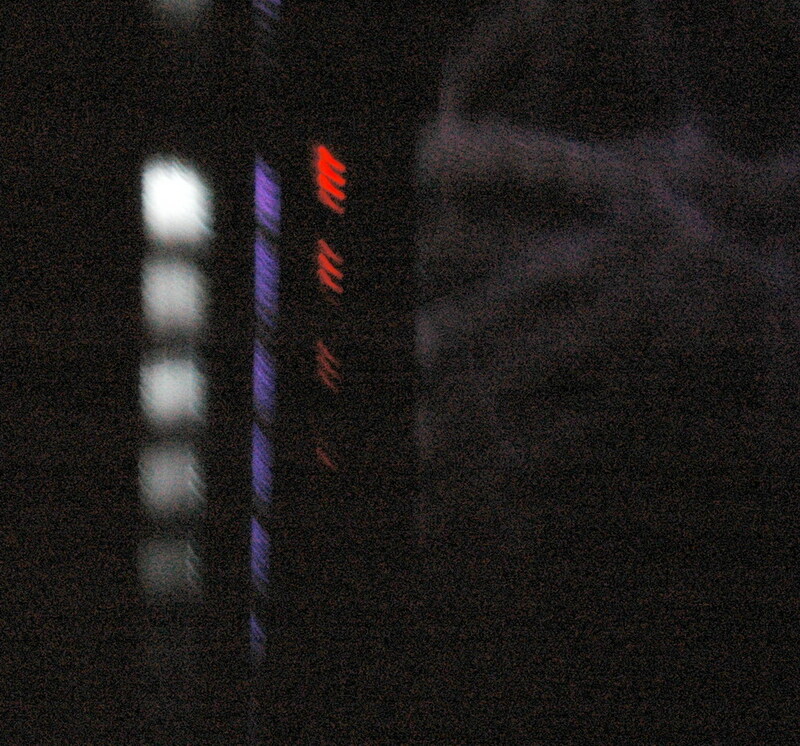 The camera (center) picks up the image from the rotating mirror on the right. The right photo shows the TC running with spark just behind my shoulder. 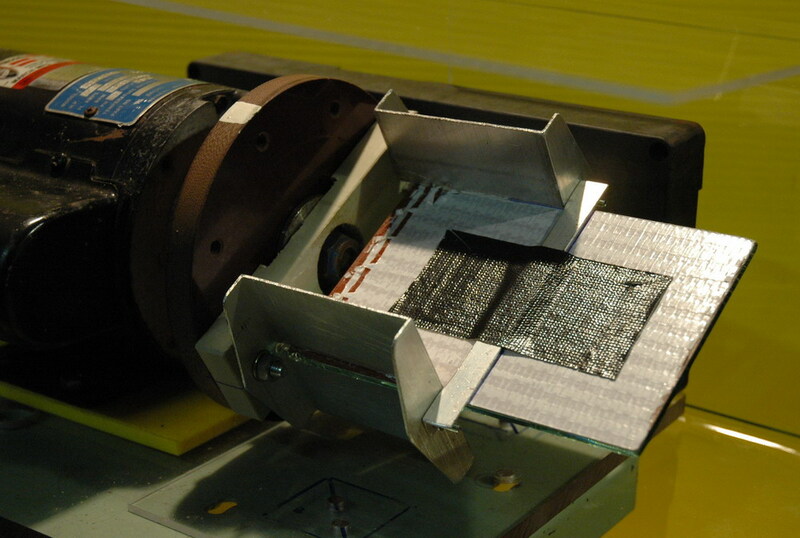 The left photo shows the reversed image through the rotating mirror (stationary for this photo) showing the toroid on the left. The right photo shows the single spark with a series of up to 5 parallel sparks. 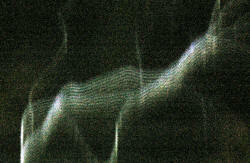 Each space between sparks is 50 pixels which is 5 us period or 200 kHz. This implies a 100kHz waveform if there are two sparks per sine wave. Seems in the ballpark for the running frequency of this coil. Note that this is not the banjo effect seen on a windy day which is just the spark gap firing rate of 100/120Hz for a synch gap (or 1100Hz with my fast asynchronous gap which was running flat out as I didn't have a third variac setup). This is 100 - 1000 times faster. Very high speed observations of spark growth can be made with streak cameras which use a photomultiplier tube to displace and magnify the image. It is about 3 orders of magnitude faster than what I am doing. It gives propagation rates of spark leaders of 10^9 cm/sec (approx 1/30 of speed of light) whereas I can only achieve 10^4 cm/sec. Still, I was never expecting to be able to see things like that with equipment found around the home. On the other hand, streamer growth has structure on very slow timescales which is why they are interesting to look at. In short, you can see them move so there are things happening at all sorts of timeframes from nanoseconds to seconds. Streamer brightness is much lower however but should register some interesting images. 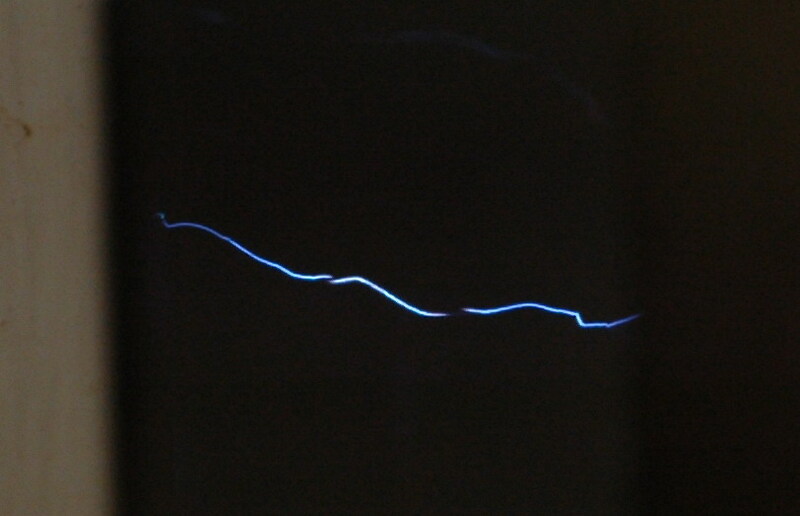 Interpretation of streak camera stuff is easy if sparks are a straight line but become difficult if angled or branched so a blurred mess is a possible outcome when I try this with streamers. I'm not sure how "useful" this will be but I hope to get some streamer data sometime. 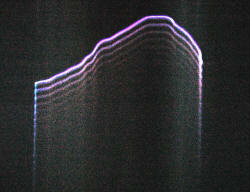 The left photo shows an arc with no following 100 kHz ring down like in the last photo. 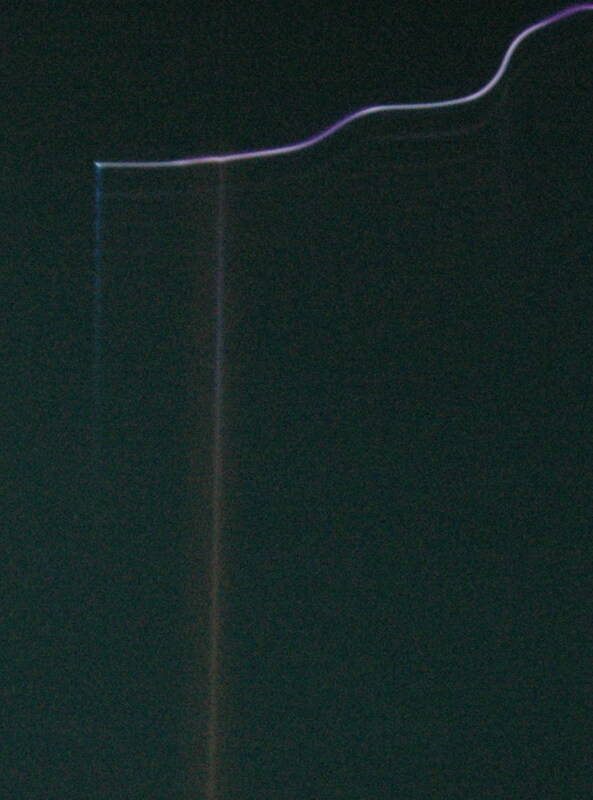 The right photo shows a bright arc with faint ring down. 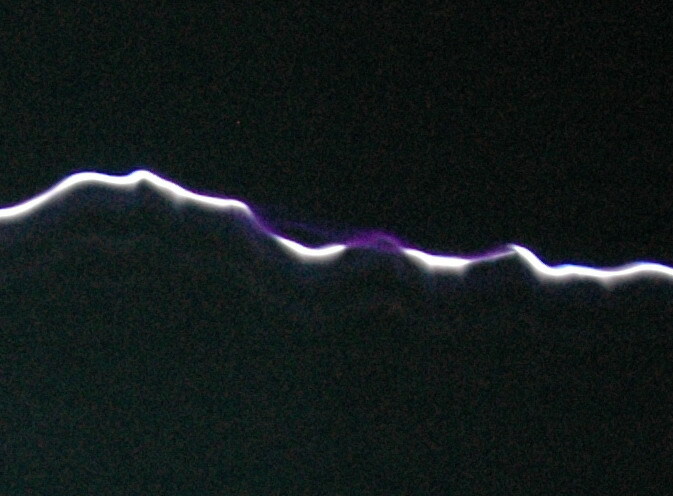 The left photo shows gaps in the bright white arc channel filled with faint purple arcs. 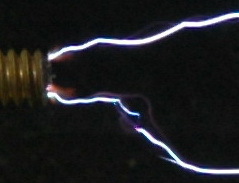 The right photo shows detail of the initial spark which has a clear central channel on the enlarged view. 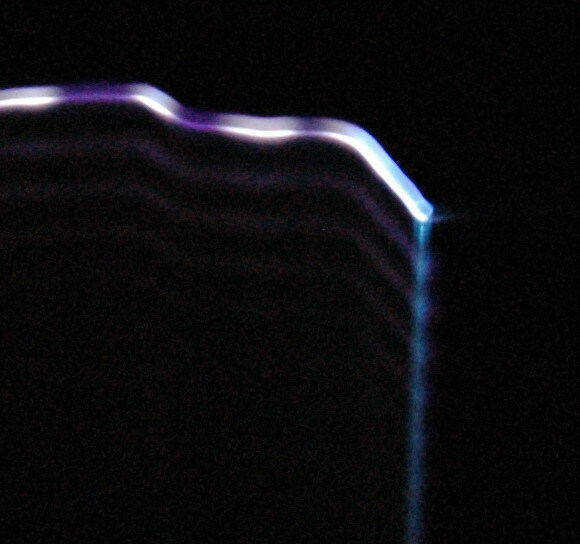 The left photo shows the ionization around the stainless steel electrode which does glow red hot at the end of a run although that is too faint to see. 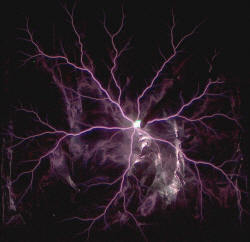 The center photo shows that the ionization is sometimes delayed by 5 us after the initial spark strikes. 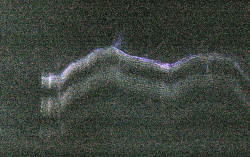 The right photo shows an unusual streak that I suspect is the spark channel hitting a dust mote and burning it up. 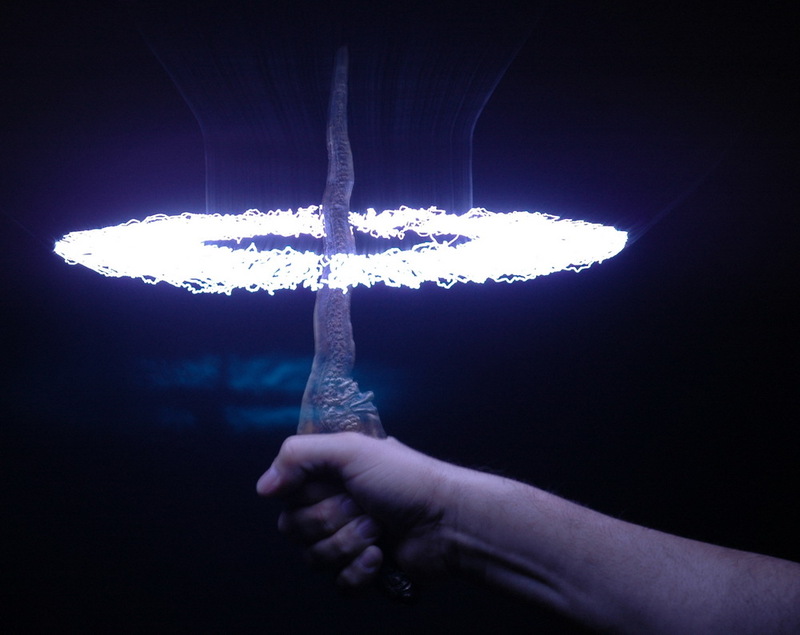 The left photo shows a streamer which is about 12 inches of an 18 inch spark from the toroid side on the left. I was throttling the variac back to try to just get streamers and few hits. It is quite different. Time axis is downward. 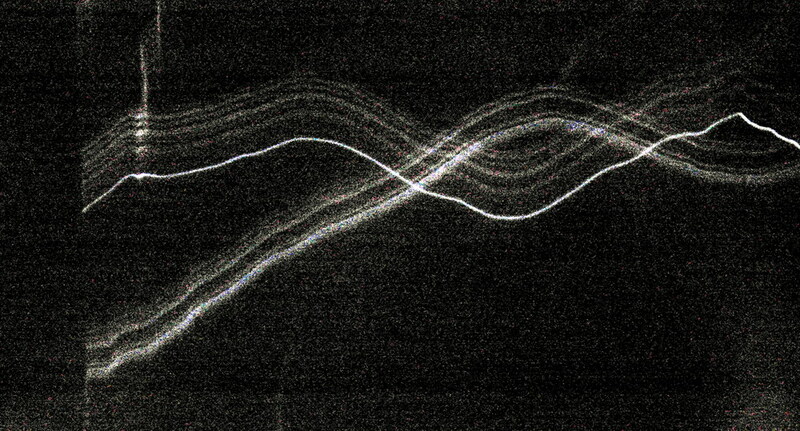 The initial streamer sparks (the top one) can be broken into perhaps 6 consecutive channels (5us apart = 2 pulses per 100kHz). Although it is difficult to be sure, only the last one makes it across the screen then a 10us gap then the main arc hits. Interestingly there is no ring down on the main arc, however the distances are greater and intensity is down. The center photo shows two different streamers which are unrelated but overlapping. 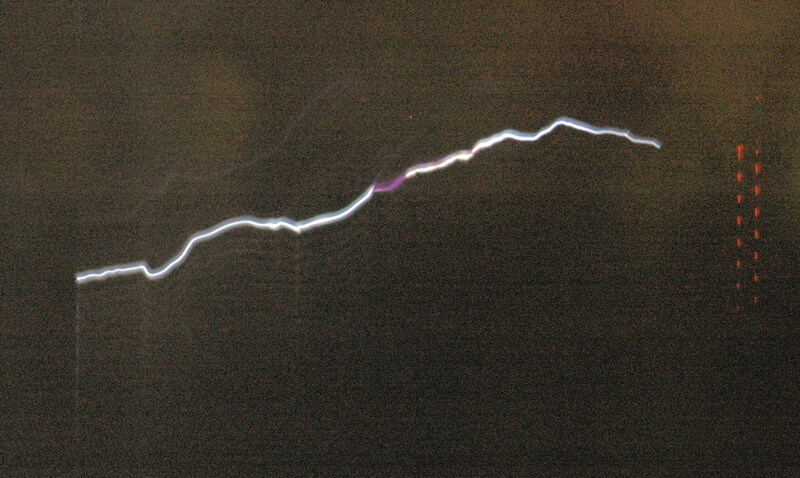 It shows the variability in intensity of subsequent spark channels and the gap before the main arc forms. 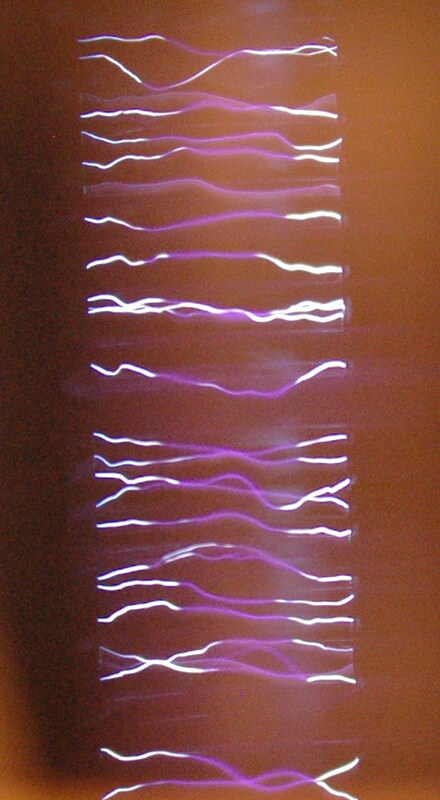 Perhaps this is a harmonic effect and the spark channel is actually of greater energy than the channel before The right photo shows the streamer ring up sparks of as many as 8 sparks in a row. I guess the new information from the rotating mirror stuff is that streamers enlarge with successive cycles and ring up leading to a spark that connects. Sparks that connect (often) have a ring down. Not really unexpected from the CRO pics but nice to see it directly. So streamers ring up and sparks ring down - easy to remember. 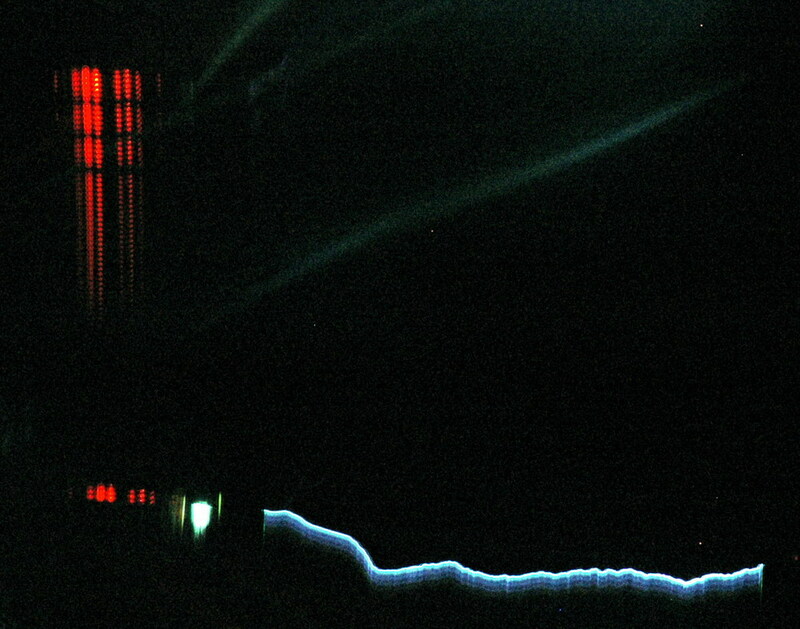 The left photo shows the spark with some red lights on the right. 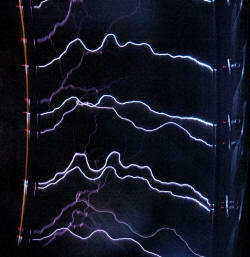 These indicate polarity and the LED closest to the spark indicates a negative discharge from the toroid on the left. Next the right LED lights up with the positive cycle and so on. 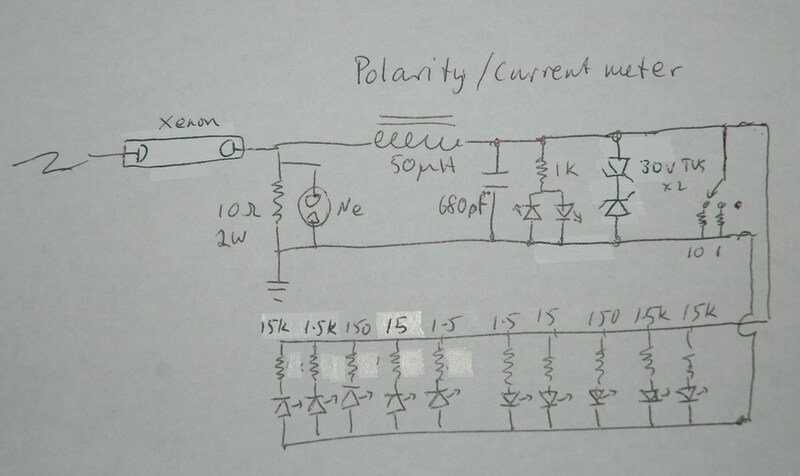 This shows polarity for more cycles than the eye can readily see from the photo. 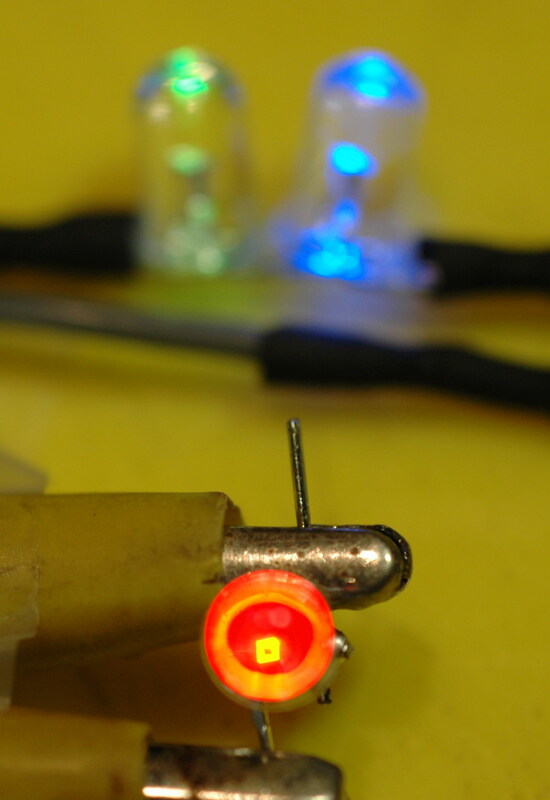 The center photo shows detail of the LED's. The right photo shows the same photo as the center one but with a full view also with a negative leader. The photo above shows the red LED's in circuit. 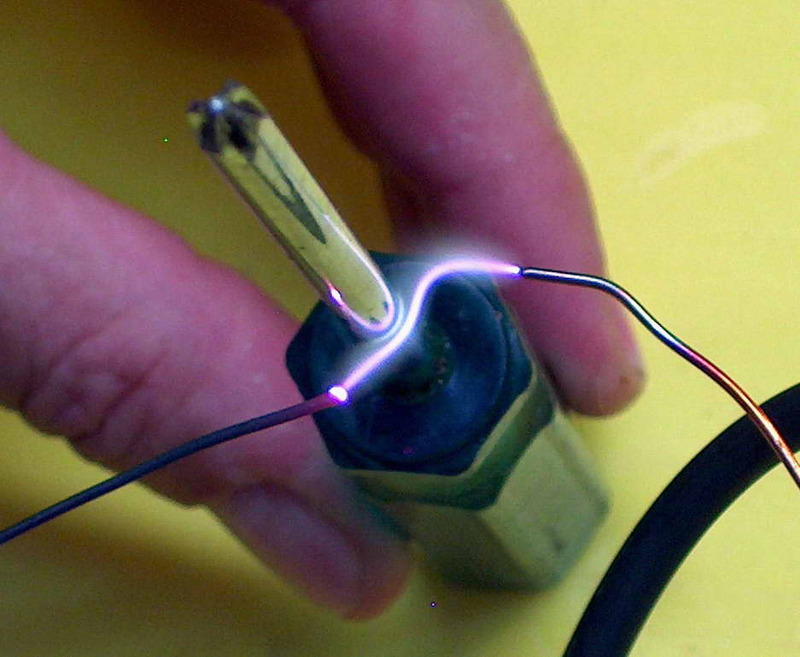 The spark goes directly to one end and the other end is grounded. There are two 10 ohm resistors and the LED's are connected in parallel but with opposite polarity. These values are determined by experiment and are strange but it works. For example you can't light the LED's with DC unless you put in 0.4 A which dissipates 4 W and burns up the resistor which has a 1 W rating. The LED's are bright in action and since they are turned on for only a few microseconds at a time in with a low overall duty cycle, must have a very high output during this time. 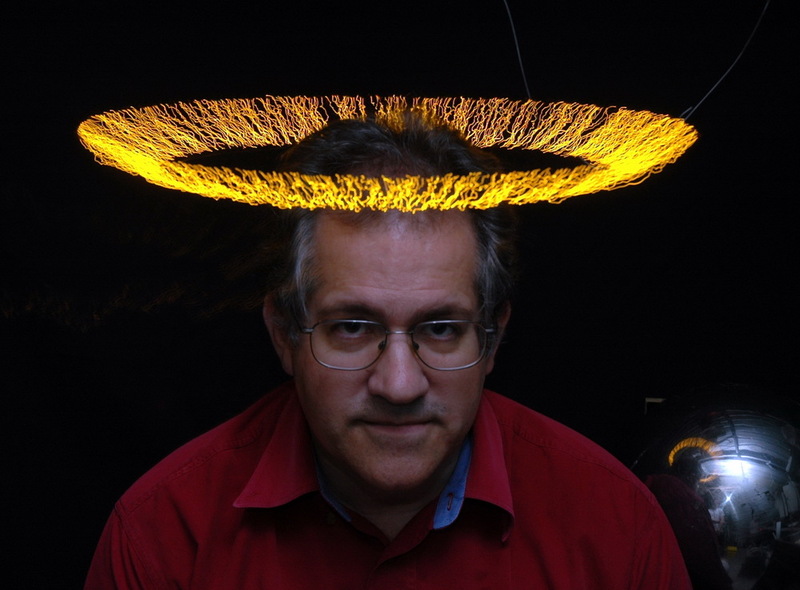 The left photo above shows a single LED being remarkably tolerant to high voltage impulses. The center photo shows the circuit diagram of the current meter and the right photo shows it in action with ignition coil sparks. The current range is a nominal .002 A to 20A and has a reverse LED as well. All this is hard on LED's which don't last long. LED's can die by degrees as below. The left photo above shows a normal red LED driven by 6 VAC via a 1 k resistor plus antiparallel green and blue LEDs which is my wired test setup (very handy). 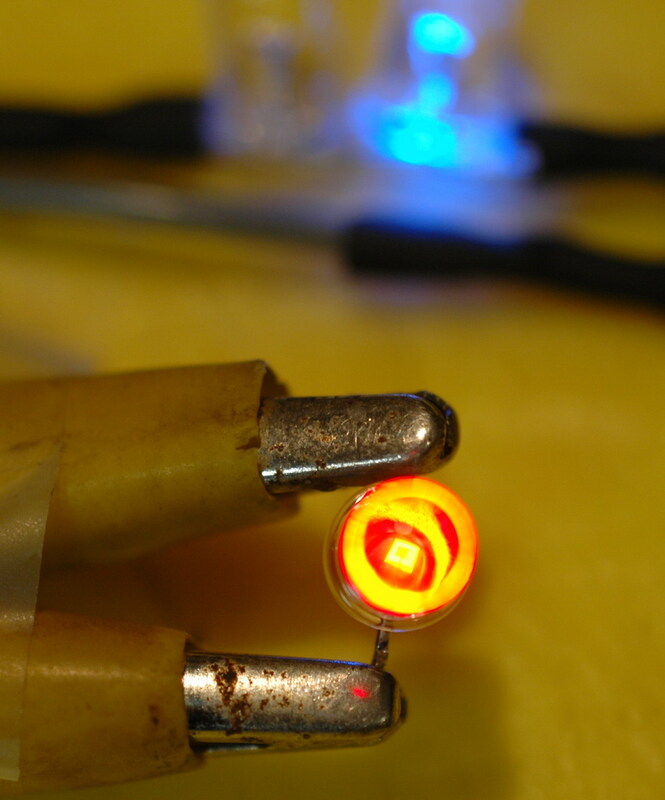 Note the LED die (light emitting square in the centre of the LED. Only the blue LED lights as current only passes in one direction. 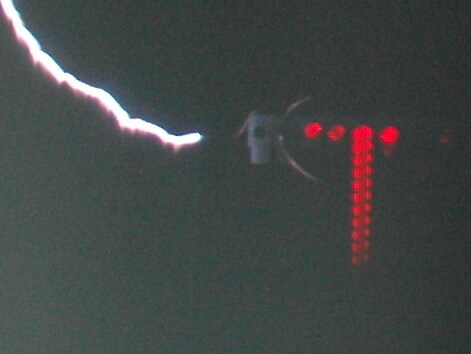 The centre photo shows a partially dead LED where the square die has a non functioning area. 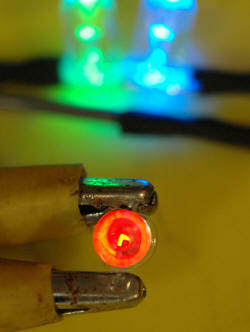 In addition the LED is not bright and it conducts in both directions as both green and blue LED's light up. 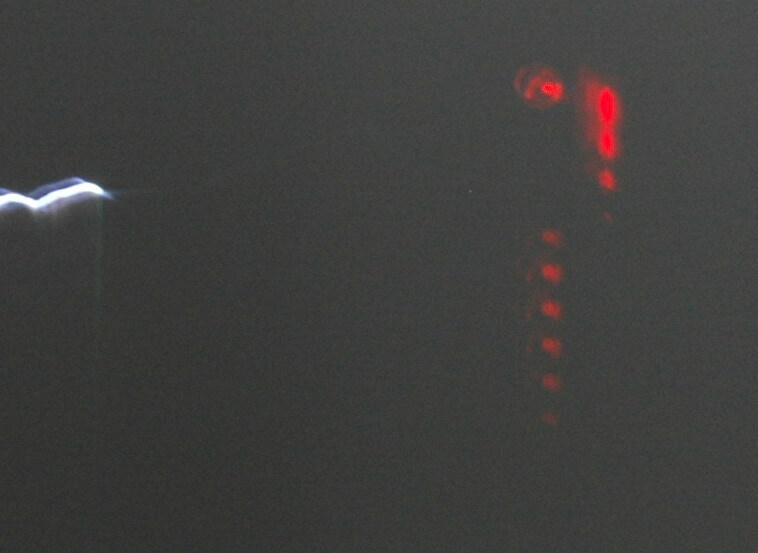 The right photo shows a partially dead LED where the square die is still normal but the LED is not bright and it also conducts in both directions as both green and blue LED's light up. This is the second reincarnation of the current meter. The left photo above shows the circuit diagram. Xenon light is first in series because I thought that would be most sensitive. 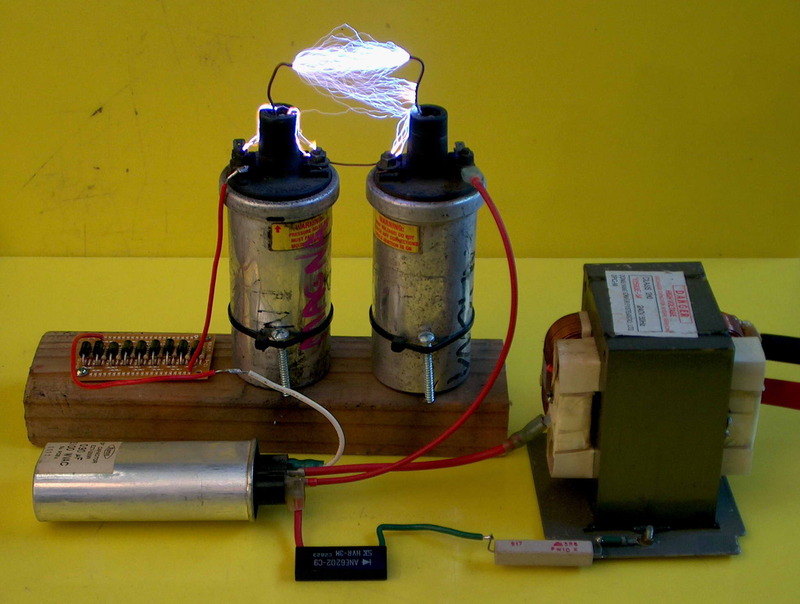 The main current path is through a 2W 10 ohm resistor shunted by a neon. What I want to do is to remove the nastiness of the spikes then use a 1MHz low pass filter with windings on a ferrite core and a ceramic cap. 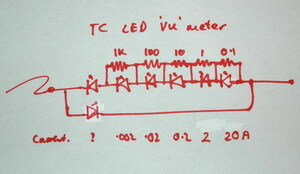 After that a TVS should be able to work to limit voltages to +/- 30V and the LED's will do the rest. The LED array should read in decades but I probably should put individual shunt resistors rather than an overall one. This needs to be redesigned as it won't work as intended and I need to give this some more thought. The centre photo shows the xenon in action with the lights in the same horizontal line. The right photo shows the rear view with the mostly covered neon on the left and two indicator diodes on the right which should be running within ratings and shouldn't blow but won't be very bright either. Here is the same motor but with a bigger mirror of 7 cm square, more compatible with the size of my camera and it shows the lens cap for comparison. 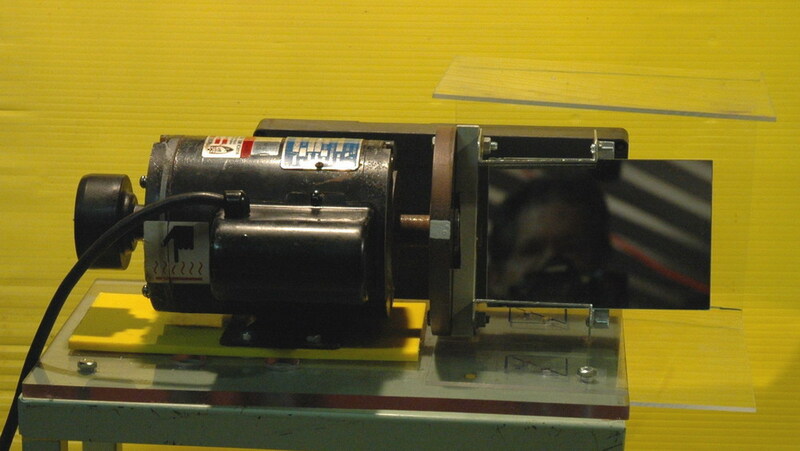 The left photo shows the view of a 25 inch spark with LED monitors on both toroid and ground ends with the rotating mirror stopped. The centre photo shows a negative strike from the toroid end to ground with the appropriate polarity being mirrored at the other terminal with identical ring down. It is not always like this and the toroid end in particular often has less ring down than the ground. The right photo shows a streamer with a ring up and after several rings it strikes. I am not sure if the bright spark above it is related. It is possible that a strike had a ring down but restarted as a streamer down a different channel which rung up until it struck again. 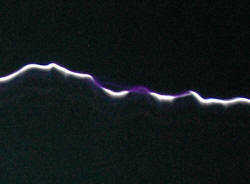 The left photo shows a streamer from the toroid and a straight streamer from the other side. Unfortunately this was a strike that bypassed my LED and went directly to the grounded ladder. It was only later that I appreciated that the three groups of LED flashes was showing a harmonic frequency influencing the output. The centre photo shows a streamer with a clear ringing which fades. The right photo shows a spark (bright horizontal) with ring down, superimposed on a diagonal streamer with a ring up. The photo above shows the new larger mirror measuring 10 x 15 cm. This is a higher quality rear silvered mirror with no visible distortion on viewing at a distance. It is well centered but moves a fearsome amount of air and has some vibration at 3000 RPM (250 VAC) but 2000 RPM (85 VAC)seems comfortable. The reduced revs should be countered by the much clearer and wider view. Still needs to be tested in use though. It is a big mirror to spin fast but the aluminium supports seem to hold it firmly without adding too much weight or obstructing the view. The left photo shows the much sharper pictures which reduce the spark to about 3 pixels width. At about 100 pixels per inch this is about .03 inch or about 1 mm. This is a daytime shot so contrast is low. The right photo shows detail which has been left pixilated showing how narrow the focus is. This is from 8 feet showing each pixel of 1/100 th inch. 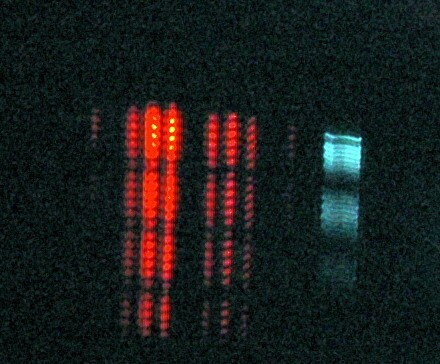 It also shows two parallel artifacts. I think these are from mirror stresses giving aberration from a flat surface. Alternatively, they may be internal mirror reflections from the rear silvered mirror but these should only be on one side if that was the case. Fortunately they are horizontally displaced and can be differentiated from vertical displacement with spark ring down. Now that the camera is getting a full lens view of the whole spark it should achieve close to its optimum performance. Seemed to get worse during the day so needs a new design with no stress and epoxied in place. This was a daytime shot and in retrospect was probably sharper than the night shots as it was f18 and 1/10 sec. Night shots were f3.5 and longer duration. Possibly a proper optically flat first surface is needed. At a motor speed of 2160 RPM and camera distance of 8 feet, the scan speed is 900 feet per second = 300 m/s. This is around 1,000,000 pixels per second. So 1 pixel per microsecond which is a nice round figure. Hence the ring down sparks should be 5 pixels apart at 200 kHz per half cycle which is 10 times slower than some of the photos above. However this is with a full 2 foot spark in view. If I change lenses and distances this can be spread out much further but I could not fit the full 2 feet width in view. The left photo shows the negative LED firing well and repeatedly, but I guess this was due to some asymmetry in the LED's as it seems to be happening on one day. Makes you wonder though as I was using slow rotary spark gap (ARSG) rates today. The alternative explanation is of another harmonic frequency being involved. The right photo shows a current meter but I have had problems with it. Possibly overvolting the metal film 1/8 W resistors. Certainly looks like one resistor is open circuit here. They should fire at 0.01, 0.1, 1 and 10 amps respectively left to right but the 1 amp LED is firing too readily. The 100 A and above LED's never fired. (but did with a capacitor on a rectified ignition coil setup). The left photo shows a second and possibly third group of streamers following. The right photo shows the addition of a spark arrestor and a disposable camera xenon flash in series with unprotected LED's. I got this interesting but blurred streamer shot showing a remarkable 6 streamer groups that the camera and LED's weren't picking up. Seems like there is a another frequency superimposed of perhaps 8-10 kHz. I presume that this is the difference between primary and secondary resonances (the "notch"). 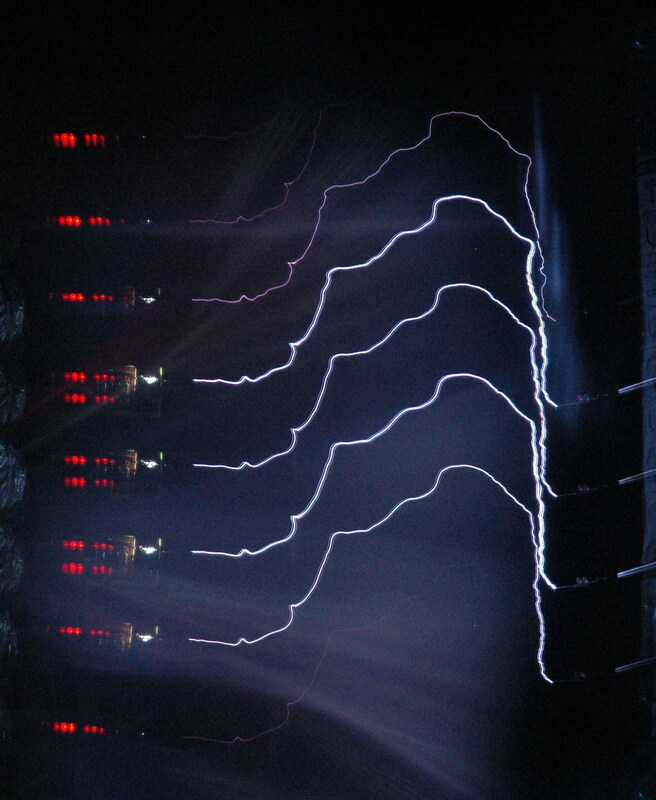 I am running the Tesla coil a bit out of tune still so that may account for that. It could actually explain a row of negative only ring down sparks as well. I think the spark gap arrestor is the most sensitive at picking up streamer currents and is more of a point source than the Xenon. The left photo shows a streamer branch with only alternate streamers progressing from left to right after the branch. 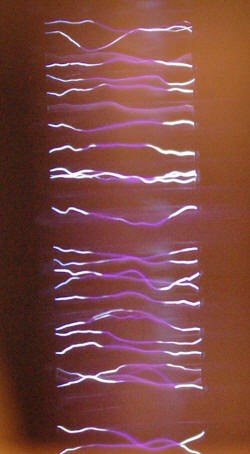 This suggests some polarity effect at the time e.g. negative goes to the upright branch and positive continues on. 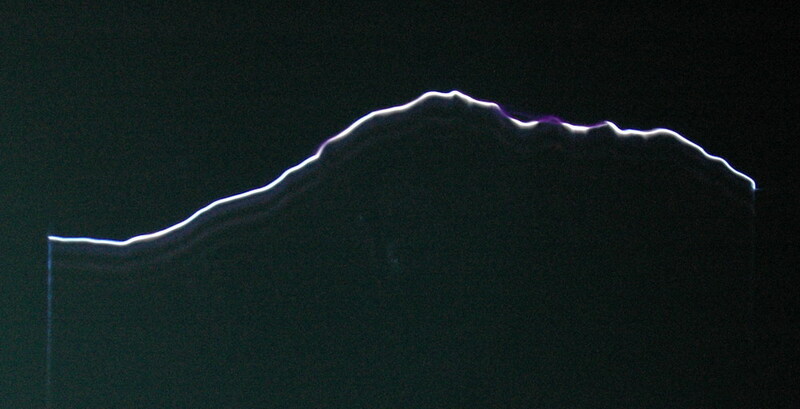 The right photo shows detail of a streamer that connects during the time when the harmonic is resulting in low voltages, hence the current is low and the spark is not strong. 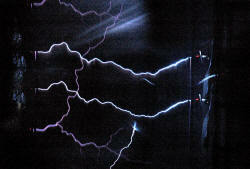 As the voltage picks up, there is enough energy for a second strike. The left LED's are not functioning properly but do indicate the first group of firings then a gap and then a second lot starting. 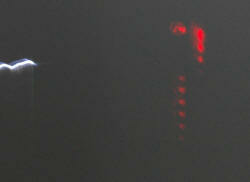 I also have the spark arrestor running here which is the blue streak between the LED's and the spark. The left photo shows a 4 foot streamer branch and multiple spark views. 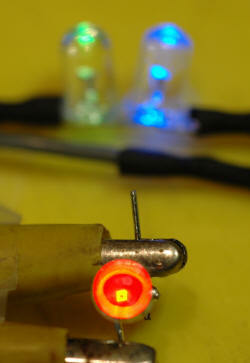 The right photo also shows multiple views of a 3 foot spark burning up the resistor to the LED's. The left photo shows the second version of the current meter. Just regard it as a sensitive single indicator LED at present. 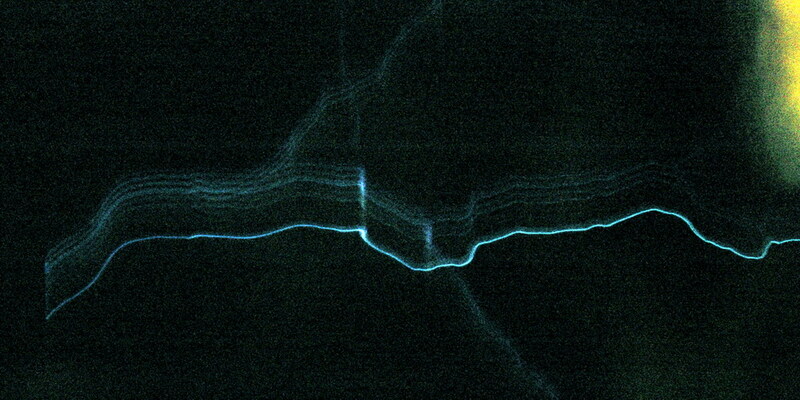 A spark recorded relatively brief activity only but a nearly invisible streamer gave a prolonged ring. I did wonder if this was due to ringing from the 1 MHz low pass filter but in other shots the Xenon is firing for a good proportion of these so that resonance seems unlikely. The ring frequency of the filter should be ten times faster in any event. 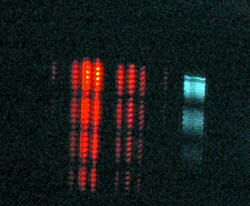 The right photo shows the Xenon (blue region on right) firing for the first three groups. 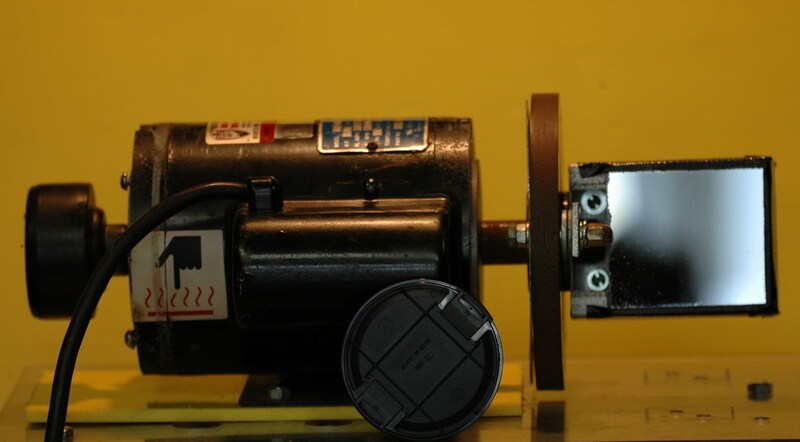 The photo above shows a view with the motor running at a slow 200 RPM (instead of 2000 RPM). It shows the sequence of strikes down the same channel. Spacing between sparks is about 1.5 ms which corresponds to about 600 Hz which is about right for my spark gap at about half speed. What you are seeing therefore is sparks rising in one half cycle of 50 Hz mains with the intensity increasing and then decreasing. Terry Fritz has done a lot of work on streak cameras as well with excellent results. His pictures and the race to develop this is detailed in this thread in the 4HV forum. More sparks of course. Hopefully some Guinness World Record stuff.